"Our activities bring our customers a 10-50% increase in performance in international education and real estate alternative asset classes." "The team of StudentMarketing under the leadership of Samuel Vetrak is always dedicated and eager to help us understand markets that are often under-documented. From quick scans or full in-depth reports, information is provided fast and with tips for who-to-talk to stakeholders." “StudentMarketing has provided us with a much better understanding of the marketplace and allowed us to formulate a better marketing strategy." “We commissioned twenty-five reports about the Student Accommodation Market across certain European cities. Overall, the reports were useful for the team to identify and target potential partners within those markets as they included detailed lists of the existing Student Accommodation in each of them." "We are very pleased with the outcomes and information StudentMarketing provided. We will certainly ask them for further analysis in the future." 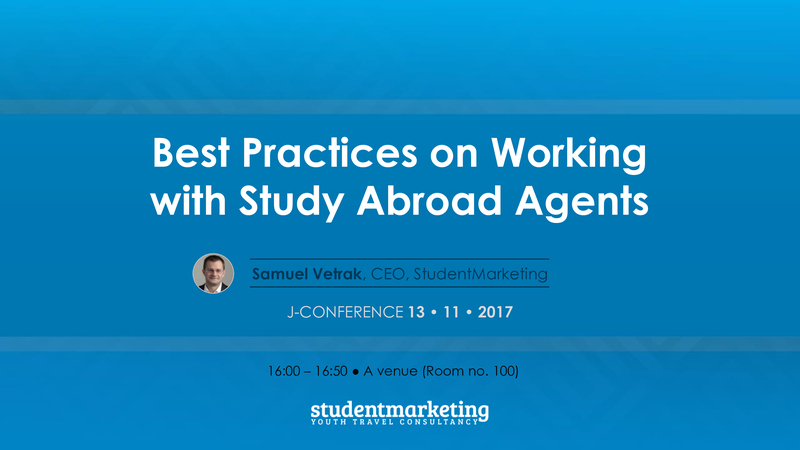 Samuel Vetrak, CEO of StudentMarketing, travels extensively around the world presenting at conferences, workshops and businesses. Take advantage of our market analysis resources to start improving your industry know-how and your business. If you would like Samuel to deliver a tailor made presentation at your conference or workshop please contact us. Stefan Kolibar, Head of Marketing at StudentMarketing, has outlined the current challenges in the Spanish student housing area. Spain’s PBSA market has been undergoing a dynamic evolution – referring particularly to the fact that the first major portfolio transactions took place last year. Spain has been an attractive destination for both domestic and international students among others due to its high standards of living. Stefan has confirmed the growing interest from student housing providers, municipalities, and higher education institutions on how to best serve and leverage increased interest from young, talented populations coming to Spain. What are the expectations of internationalization in the future? How can the city balance international students and tourists, while being mindful of the needs of local residents and the livability of the city? If you are interested in getting more data or intel on European student housing, please do not hesitate to contact us here. 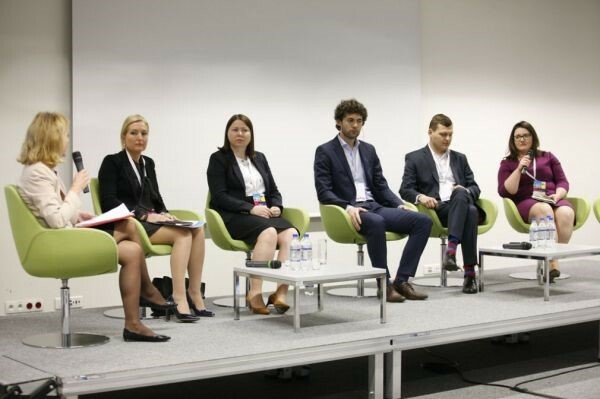 StudentMarketing represented by Stefan Kolibar, Head of Marketing, has been invited to chair the student housing panel and speak about the CEE student housing asset class backing on data collected about more than 106 portoflios mapped. He defined Wroclaw (Poland) along with Vienna (Austria) followed by Brno (Czech Republic) as the cities with the highest demand in CEE. Moving to the expectations observed at this market, he has shared the inputs collected by StudentMarketing, which have confirmed the importance of in-house facilities, e.g. bike storage or library, playing the key role in the decision-making process. Stefan has also presented some of the active players in the student housing industry in the CEE region, e.g. Griffin Real Estate or Zeitgeist Asset Management to mention a few. Stefan Kolibar, Head of Marketing at StudentMarketing, has presented the first stage of the student housing research for 2018 Milan, Italy, conducted by StudentMarketing. He has described the city as a modern, dynamic with very low supply and a boosting demand. In this regards, biggest market players have been briefly mentioned. Stefan has explained how the city can benefit from the young mobile population long-term demonstrating this fact on figures from the research. Samuel Vetrak, CEO of StudentMarketing, has defined the recent trends in the European student housing area highlighting Vienna (Austria), Milan (Italy) and/or Warsaw (Poland) as the cities with the best investment potential. Samuel has described in more details what students considered the most crucial feature when choosing their destination with London staying on top of their list. The inputs collected by StudentMarketing have confirmed that it is amenities, e.g. study rooms or communal kitchens, which play the key role in the decision-making process. Backing on up-to-date data about supply/demand dynamics, portfolio, yields, important aspects for the students such as facilities and additional details on student preferences, Samuel provided a clear picture on investment opportunities in this alternative asset class. Stefan Kolibar, Head of Marketing at StudentMarketing, has been invited to the panel discussing the Polish student housing market. We can now see that investors are shifting their attention to Central and Eastern Europe and the Polish market is leading this trend due to its sheer size,” stated Stefan. The panel has discussed 3 most interesting cities in terms of investments into student housing in Poland, namely Warsaw, Kraków, and Gdańsk. It has been shared that the universities failed to show deeper interest in the development of private student accommodation first. On the other hand, student communities have been calling for higher standards compared to public facilities resulting in a booming market in Poland. Looking back at more than 7,400 meetings scheduled at 3 continents in 5 years, Samuel Vetrak, CEO at StudentMarketing, and Maria Gibalova, Head of Events & Business Solutions at StudentMarketing, have shared their experience in organizing successful trade missions for various school associations, incl. CAPS-I. Maria has confirmed that the key to success is speaking to the right, carefully pre-selected agents with interest in particular type of international education, be it language courses, secondary schools or universities. Furthermore, she has explained that besides pre-scheduled individual meetings with agents, the participating schools can also take advantage of embassy present, market intelligence shared, and networking opportunities provided. Should you be interested in organising a trade mission, please, send us an e-mail here. Patrik Pavlacic, Head of Research at StudentMarketing, has presented the first-of-its-kind research in the ELT industry aiming to better understand the motivation, decisions made and factors impacting satisfaction of the students learning foreign languages abroad. This independent online survey at IALC schools involved a broad span of respondents - students aged 17 or less until 55+ from 136 countries having delivered 4,755 responses in reference to 9 languages. Patrik has explained that personal reasons stay the top motivation to learn a language abroad although relation to current studies is on the rise, too. He added that students tend to rely on online tools throughout the whole process, i.e. source of information, selecting their language school up to the actual booking, etc. Patrik has underlined that English is an exemption, where agency plays a key role. In total, however, 75% of students have not used agency at any stage of the booking process. The survey has also revealed that it is teachers who are the most important asset of a school followed by how well the students can be assisted with their needs. This and more data should provide the market players with a solid foundation for their next steps. Should you be interested in more details, please, send us an e-mail here. Samuel Vetrak, CEO at StudentMarketing, has provided an in-depth analysis of Mercosur countries in terms of market development and attractiveness of Canada for these source markets. Closer look was devoted to how the number of student weeks evolved in comparison to both Canada and other top 8 ELT destinations in years 2012-2016. To compare, Turkey recorded as many as almost 300,000 student weeks whereas Chile, the most active Mercosur market, reported 75,000 student weeks. Samuel has confirmed a fair coverage of agents having included language programs in Canada into their portfolio and informed about trade missions planned in Santiago, Chile in autumn 2018 and Istanbul, Turkey in 2019. Samuel Vetrak, CEO of StudentMarketing, has presented the latest data and market trends in European student housing market. The highly-awaited industry update has brought recent figures on supply, demand, provision rates, yields, pipeline, student preferences as well as in-depth knowledge about investors, developers and operators actively engaged in European student housing. What are the agent – university partnerships like? What is the agent’s role as channel partner in higher education and international student recruitment? How do students perceive agents and the services they provide? A survey conducted by StudentMarketing and presented by Patrik Pavlacic, Head of Research Department at StudentMarketing, has tackled these major questions. Firstly, Patrik has explained that this research is of a global coverage offering a wider context and more options to compare e.g. on country-to-country level or individual study destinations. It has covered topics such as role of pathway operators, double dipping, transparency fraud or role of the press. Second stage of the survey has dealt with preferences of prospective students originating from 121 countries with regards to taking the advantage of an agent. Patrik has pointed out that the students are more sophisticated and practically-oriented, whereas as many as 83% would recommend the agency they cooperated with although as few as 39% applied through an educational agency to their current university and/or college. The research also covered issues such as how do students choose an agency, feedback or the level of trust in the source of information. In years 2014 – 2016 there was a decline observed in the global ELT industry. Samuel Vetrak, CEO at StudentMarketing, has outlined both the past development and future review in the ELT industry with Turkey, reaching to almost as many as 45,000 student weeks in 2016, clearly leading the demand for Canada. Leaning on global ELT data for 2016, Samuel has explained that English and German are learnt for a specific reason, usually work-related, whereas e.g. Portuguese and Italian language learners are triggered more by rather personal reasons. Moreover, Samuel has provided a look into the future stating that the students are becoming younger, agents shall be furthermore used to the current extent or even more and that China is turning into an exciting market. Mergers and acquisitions should also be a typical feature of the upcoming 10 years as well as innovations, joint / selective targeted marketing actions and more demand for data, said Samuel. How was 2017? And what to expect this year? In this session, Samuel Vetrak, CEO of StudentMarketing and a renowned industry strategist, featured the newest data on trends, mobility, demand levels, preferred programmes, source markets performance and other useful inputs and implications for school owners, marketers as well as agents. This session was designed exclusively for English UK member school representatives to benefit from the latest market data and make informed decisions. 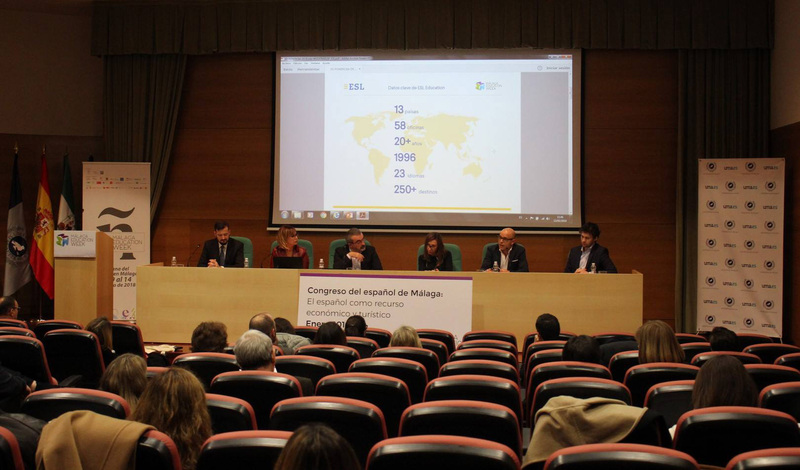 Stefan Kolibar, our Head of Marketing, has attended Malaga Congress as part of Malaga Education Week. The joint initiative of local, regional and national public and private stakeholders focused on Spanish language as an economic resource and attracted lot of media and public attention in Spain. Stefan was invited to speak about StudentMarketing's experience with study destination marketing and how other destinations benefited from tapping into international education. More information about the event held solely in Spanish can be found here. Should you be interested in learning more about study destination marketing, please click here and we will be happy to arrange a meeting. 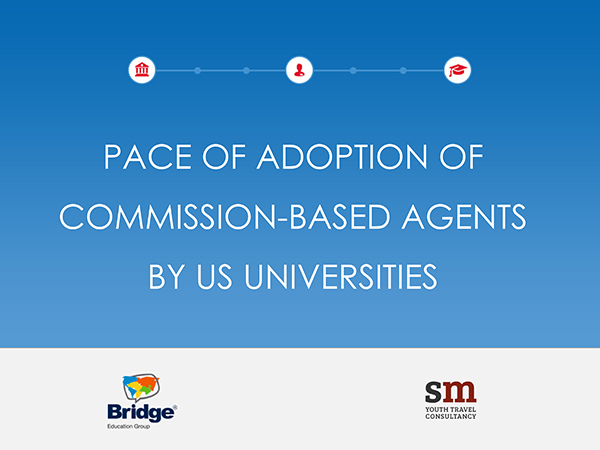 In 2016 the results of the landmark study “Pace of Adoption of International Student Recruitment Agencies by U.S. Institutions” provided an in-depth analysis of agency engagement and issues and controversies surrounding the use of agencies and incentive-based recruitment by U.S. institutions. In this second phase of research Bridge Education Group and StudentMarketing analyze the perceptions, experiences, and practices of agencies from the student perspective. The goal of this research is to provide both transparency, and actionable data for agents, universities, accrediting bodies and other key stakeholders in the area of international student recruitment. If you are interested in learning more about this initiative, please click here to send us an email. The European student housing market has seen an increasing demand from investors, funds and operators, with Germany, the Netherlands, Italy and Spain attracting most of the international investments. Samuel Vetrak, CEO of StudentMarketing, a global market research company, provided a detailed insight into European student housing trends, including top countries, best-performing cities and most popular schemes, taking into account regional variables and any barriers to entry. 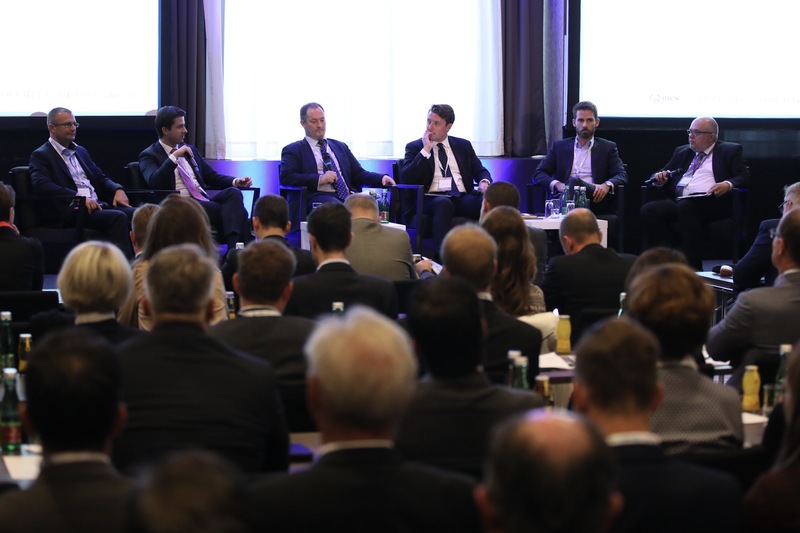 Following his presentation, Samuel hosted a panel of industry experts who comments on the following topic: "With lessening of regulation and more favourable investment conditions, what trends are we seeing in mainland Europe?" 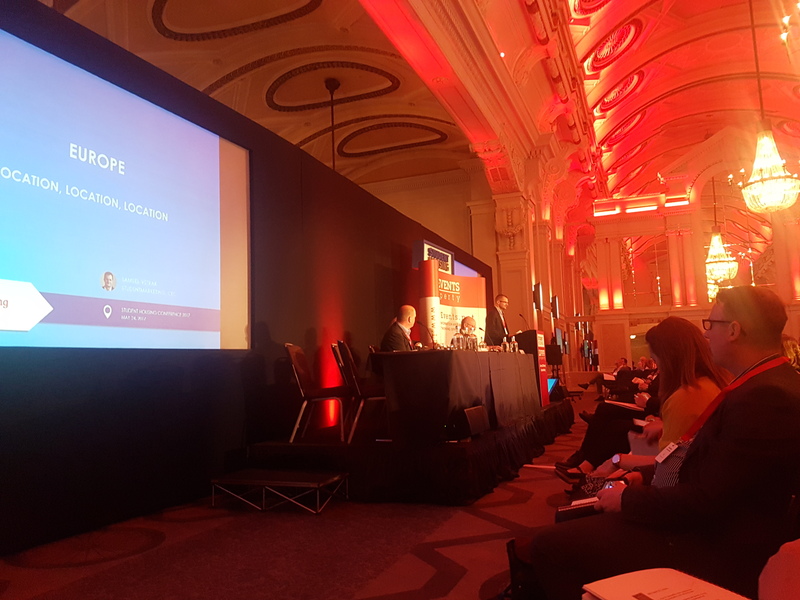 The session highlighted the European markets that currently present the most attractive opportunities as well as challenges companies face delivering schemes across Europe. Are you interested to learn more about student housing data & trends in continental Europe? Click here to send us an email. 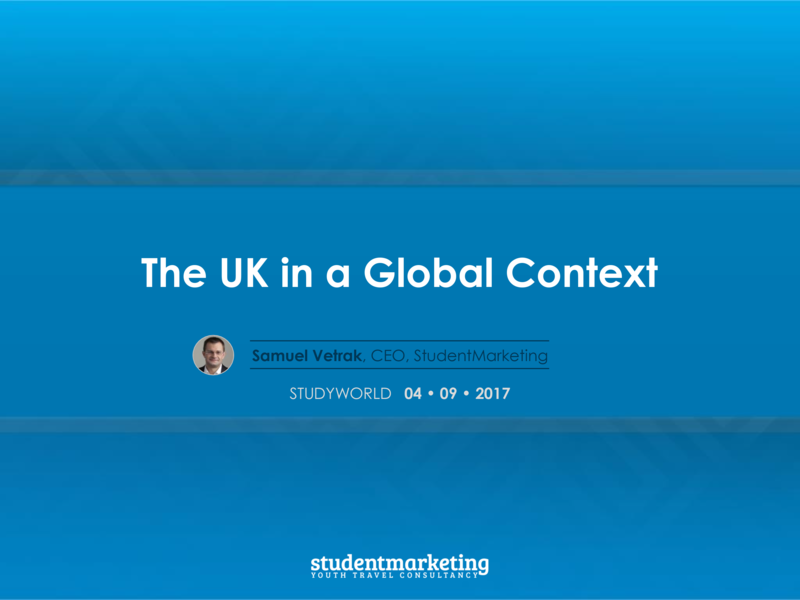 Samuel Vetrak, CEO of StudentMarketing and an industry strategist, reviewed key performance statistics on the UK as a study destination and drew comparisons to its global competitors. Samuel identified trends and patterns in data, incl. market numbers, destinations, source markets, student demand, customer preferences and provided much-needed future market outlook going beyond 2018. His main focus was put on uncovering the development opportunities that lie ahead for UK stakeholders in challenging times. If you are looking for more data on UK or global ELT market, please click here to send us an email. What are the best locations for student housing investments in Europe? 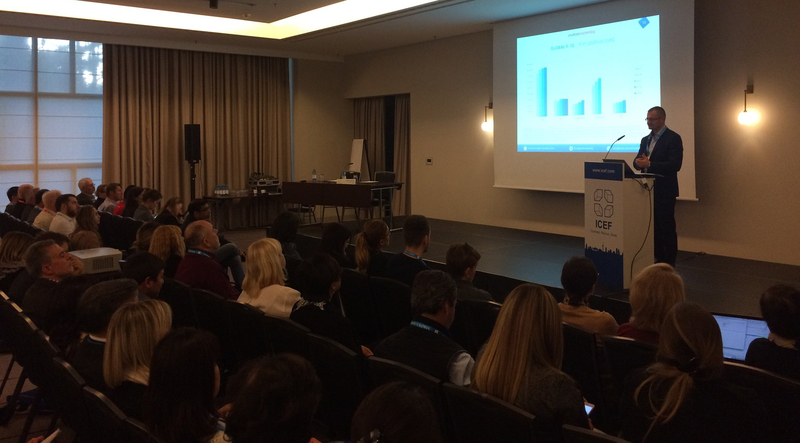 Samuel Vetrak, CEO of StudentMarketing and a renowned industry strategist, presented the latest market trends at The Class Conference 2017 in Lisbon. In his session, he provided a complete overview and comparison of countries and cities, incl. data on the long-awaited customer preferences as well as supply and demand. If you are interested in learning more about the presented data or you are interested in learning more about our data and intelligence, do not hesitate and send us an email. With the national target set for 300,000 international students by 2020, Japanese higher education institutions are increasingly looking into ways of strengthening its international student recruitment. Samuel Vetrak, CEO of StudentMarketing, a global market research and strategic development company, and a co-author of a widely cited report "Pace of adoption of international student recruitment agencies by U.S. institutions" has advised on all matters related to agent recruitment and management as well as shared case studies and practical stories from his work for institutions' overseas. In his presentation, Samuel drew from the aforementioned report findings and experience of U.S. higher education institutions to tackle the sensitive subject of engaging with international student recruitment agencies, its ethics and the associated challenges and benefits. Vetrak shared proven recruitment & marketing techniques, incl. how to identify and select top source markets and agents, what criteria to use, when and which countries and fairs to visit in order to increase institutions' student numbers or diversify their nationality mix. As Youth Travel continues its double digit growth, making it the fastest growing and most reliable market sector in the travel industry, the need to engage with and win this segment has never been greater. Samuel Vetrak, CEO of StudentMarketing and a renowned industry strategist advising governments, destinations, associations and organisations, has guided us through the specifics and latest trends of youth travel market – what is it, who are they, what is the market value now and tomorrow. Are you interested in learning more about how your destination could tap into this $220bn youth travel market? Write us here. 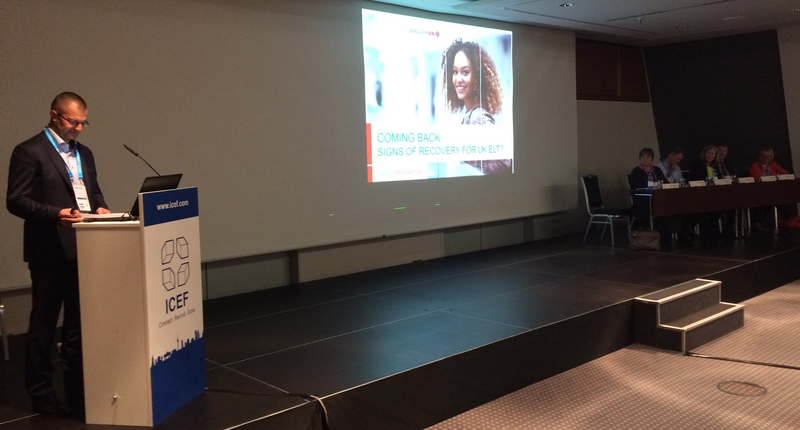 COMING BACK: SIGNS OF RECOVERY FOR UK ELT? The UK’s English language teaching (ELT) sector experienced a third successive year of decline in 2016 (student weeks were 13% down on 2015). The uncertainty created by external factors such as the UK’s exit from the European Union, elections in Europe and ‘Trumpism’ added to the impact of the structural shifts occurring as the industry matures and the ever-increasing competition between host countries. In this time of uncertainty and challenge, English UK is ambitiously leading the way. Their new statistics initiative, the Quarterly Intelligence Cohort (QUIC), gives English UK member centres quarterly, in-depth reports by StudentMarketing. QUIC helps members identify emerging market trends and opportunities, ensuring time-critical business decisions are based on robust data. Statistics from Q1 & Q2 2017 have indicated that a recovery is underway for the UK’s ELT sector. Samuel Vetrak, CEO of StudentMarketing, has presented an exclusive first-look of the quarter three report. Top line figures showed the performance of the crucial summer season and provided comparative data on previous years, providing definitive answers to the questions of if and how far the UK ELT sector has rebounded in 2017. The panel of industry experts set the numbers in context, considering the reasons behind the recovery and what the future holds for the world’s oldest language learning destination. Samuel Vetrak, CEO of StudentMarketing, has presented the most important, newest and complete market numbers & data on destinations, source markets, student demand, customer preferences and trends for 2018. The information provided will enable your institution to better succeed in the coming season. The session has provided attending schools and agents a competitive advantage in the year to come as the data will not be shared later. If you missed the presentation or are simply interested in learning more about how to shape your 2018 recruitment & marketing strategy, please write us here and we will be happy to arrange a meeting. REVEALED: WHAT STUDENTS THINK & WANT? Patrik Pavlacic, Head of Research at StudentMarketing has presented landmark research into students’ own feedback which provides vital insights for schools and agents. A new project commissioned by IALC asks students what they look for in a language programme, how they make their choices, and how they evaluate their experience. Are you communicating effectively with students and meeting their expectations? How can you reach more students and achieve higher satisfaction levels? Almost 30 destination marketing professionals have attended the 2nd edition of Destinations meet Student Travel Forum 2017, an initiative of ICEF and StudentMarketing. Samuel Vetrak, in his presentation on economic & social impact, provided an overview of international students (global numbers per sector) with international student recruitment targets as set by various global study destinations. He looked closely on economic & social impact on a city, highlighting some of the biggest benefits of recruiting international students to a city - more income, more jobs, additional tourist visits (VFR), longer stay, impact on a city's social fabric by brining new cultures and talent. He shared a case study of Barcelona and how the city may benefit from international students if it reaches the performance of Vienna. Samuel has also shared an overview of all marketing activities (traditional & innovative) implemented by most successful study destinations recently before giving the floor to his colleague Stefan Kolibar for sharing the recently successful study destination marketing campaigns. If your destination wants to explore more about impact of international students or your study destinations wants to improve its strategic recruitment and marketing, please write us here and we will be happy to arrange a meeting with you. WHERE TO INVEST IN STUDENT HOUSING? Demand from foreign students has led to a boom in student housing in Europe, while micro living has being boosted by demand from young urban professionals. What are the prospects for the two sectors in the year ahead? As the sectors mature, what are investors looking for? Foreign students will continue coming to Europe - around a million a year from China alone. Which countries or cities will attract the most? The UK has led the way in student housing and it remains the largest, most mature and most liquid market, but will Brexit and stricter visa requirements have a negative impact? Will Germany continue to gain in popularity among foreign students? What about France and the Netherlands? Or Spain which is attracting Spanish-speaking students from Latin America? Which European cities are the most under-supplied? Urbanisation has underpinned the rise of micro living. Will the rise of ‘Generation Rent’, a flexible labour market and an increasingly mobile young workforce all continue to make the sector an attractive investment opportunity? With economic growth returning to the Eurozone, which cities will benefit the most? Will rents continue to rise, as supply is not keeping up with demand? The market is very promising but fragmented in Europe Is it possible to develop a pan-European strategy? If you are interested in learning more about student housing as an asset class, please write us here and/or arrange a meeting at Expo Real 2017. Student housing has become an attractive investment product in Western Europe lately, but there are few signs of such developments in the region so far. CEE, however, is the number one choice of more and more international students, so the opportunity is present. The regional pioneers of the business and other experts came together to share their ideas and experience. Samuel Vetrak, Founder & CEO, Student Marketing Ltd.
Should you be interested in learning more about investment opportunities in the CEE region, please do not hesitate to contact us here. We would be pleased to arrange an introductory meeting. Introduced by David Chapman (WYSE Travel Confederation), the panel of three industry experts shared their insights on the current trends and challenges within youth and student travel. Mamoru Kobori (Japan National Tourism Organization), Russell Hedge (Hostelling International) and StudentMarketing's COO Igor Skibickij were discussing the 2018 Action Plan by UNWTO and how the membership base and tourism community might help spread the word on the importance of youth and student travel to destinations and other tourism stakeholders. Igor Skibickij, also a China Branch Manager at StudentMarketing, has shared that student travel is worth more than $120 bn and is now considered to be of stronger value than a traditional business travel. StudentMarketing's data shows that international students spend across the city, not concentrated in the city centre only; that they have higher average spend per visitor and longer length of stay than the average tourist. Also, it is understood that locals are generally more open to students than tourists, which stimulates a two-way cultural immersion. Skibickij demonstrated that by attracting, recruiting and retaining international talent like students, destinations can heavily benefit - from total spending through higher attendance at cultural and sports events to generation of jobs and taxes, let alone the increased possibility of former students to once return as tourists or the desire of their friends and relatives visiting the destination (VFR). If you are interested in learning more about the economic and social impact of international students on your destination or institution, feel free to let us know here and we will be happy to arrange a complimentary meeting. HOW TIGHT IS THE BORDER BETWEEN VISITORS AND LOCALS? Where do international students lie in between locals on one side and holiday makers, business travellers or day trippers on the other side? What sets international students apart? We already know that they spend more than visitors and stay longer. But what about the perception of locals? Do they recognize cultural immersion? Do they talk to each other? Are students more or less preferable by locals? Data-driven insights on these and other questions were revealed by Patrik Pavlacic, Head of Research at StudentMarketing at the TourMIS Workshop in Vienna, Austria. Pavlacic presented short-term and long-term economic and social impact of international students on destinations and how it compares to other tourism segments. 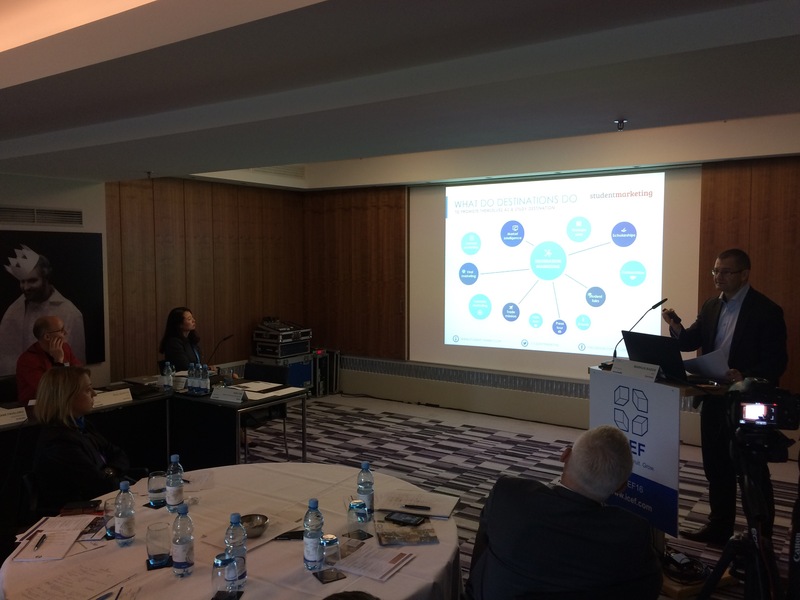 StudentMarketing, one of the ECM Research Partners, traditionally maps student recruitment targets set by various study destinations, which Pavlacic shared with the research expert audience in Vienna. We learnt that Australia expects 720,000 international students by 2025; China 500,000 by 2020 with France targetting 470,000 and Canada 450,000 international students by 2025, resp. 2022. If you are interested in learning more about key takeaways from this session, please request the presentation here. This session reviewed key performance statistics on the UK as a study destination, drawing comparisons to its global competitors. Samuel identified trends and patterns in data from all sectors and provide future market outlook. But his main focus was put on uncovering the business opportunities that lie ahead for UK stakeholders in challenging times. If you are interested in learning more about this session, feel free to send us an email. Our colleagues Samuel Vetrak and Paulina Kropacova attended LD Event's Student Housing Event on May 24th in London, UK. Samuel was one of the speakers during the panel Understanding what numbers & stats tell us about the overall picture on student housing in the UK & Europe. Samuel was talking about top investment locations in Europe based on in-depth international student mobility data and student housing usage per nationality. He also provided a complex analysis of European hotspots for investments in student housing based on per city stats such as international students, PBSA establishments, PBSA beds, supply / demands dynamics, private supply / international demand. At the end of his presentation, he shared accommodation costs in private PBSA per top European cities. If you are looking to invest in student housing in Europe and are in need of data to justify your decisions, feel free to let us know here. 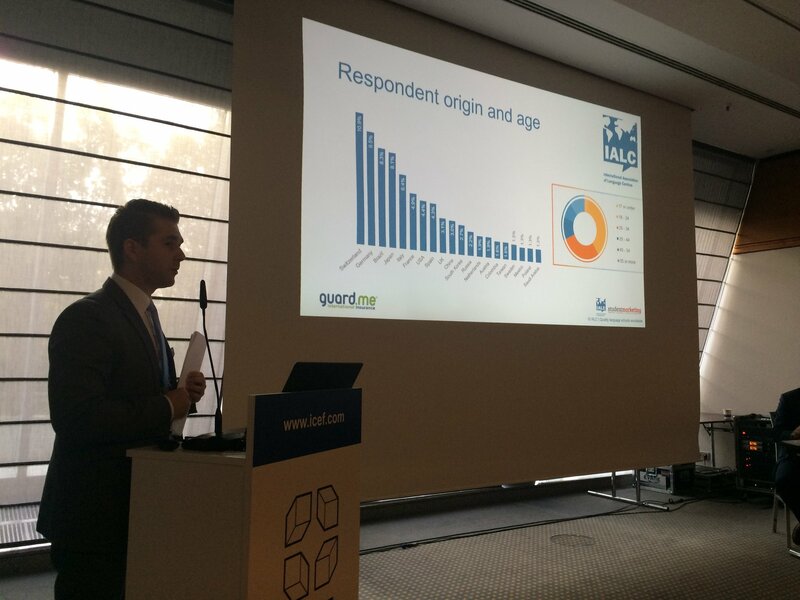 Samuel Vetrak, CEO of StudentMarketing, a global market research and investment intelligence consultancy, opened the Class Regional Session in Frankfurt, Germany by providing key variables that go in favor of Germany as a study destination comparing the country's targets with more than 40 other competing markets. 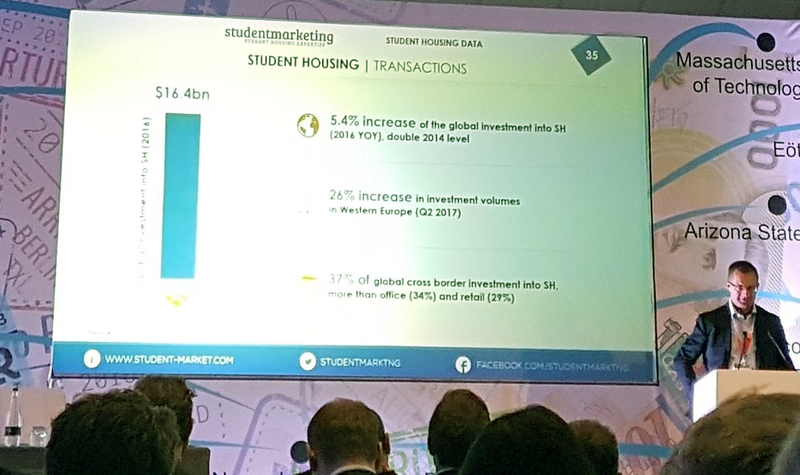 He also shared key metrics of German student market with the audience of local, pan-European or global investors in student housing asset class, incl. total student numbers, domestic vs. international mobile students, all mobile students per state, etc. In the final part, Samuel compared existing mobile students with Studentenwerk's housing supply (number of beds) per state indicating existing supply difference in the market. He also provided a projection on future increase of internationally mobile students per state which i over 76,000 students by 2020. If you are currently looking for investment data on German or other European cities, please let us know here and we will be happy to arrange an exploratory meeting. The session featured a detailed analysis of the latest edition of statistics about the UK ELT market, followed by a picture of what’s happening globally. The report also provided business intelligence to English UK members. Samuel Vetrak, CEO of StudentMarketing, has shared tips on how exactly to use the data in the report, identify relevant trends and patterns and provided an expert’s view on how to move your strategy forward. If you are an English UK member centre, please write us and request your presentation here. Samuel Vetrak, a renowned industry strategist and CEO of StudentMarketing, presented on the most current market data on trends, mobility, demand levels, preferred programmes, source market performance and other metrics available for the better performance of schools. The session was exclusively designed for International House member school representatives as Samuel provided a closer look on what schools can do to adapt to recent industry developments, with a specific focus on recruitment and marketing strategies. If you are a member school of International House World Organisation, please write us and request your presentation here. Samuel Vetrak, CEO of StudentMarketing, a leading industry strategic development firm, shared best practices when working in global marketing & recruitment. Supplemented by case studies, Samuel advised on how to identify the most suitable agents, what timing and locations are ideal and which dealmakers to consider. In case your schedule didn't allow to attend his session, please feel free to request the presentation here. The international education market has already hit 7 million international students and is set to keep growing up to almost 10 million within the next 4 years. With fast-growing international education and meaning of travel being more important than ever, are tourism experts correct in saying that student travel is the next big thing for destinations? In its 7th consecutive year, the Youth Travel Summit saw governments, associations, destinations, providers and non-industry experts discussing the broader economic, political and societal impact of this $100bn industry. Each of the panellists had an opportunity of a 5-minute presentation to demonstrate the initiatives made by their organisations based on the latest trends and future projections. Should you be interested in learning more on how destinations can tap into this $100bn industry, please, do not hesitate to contact us here. 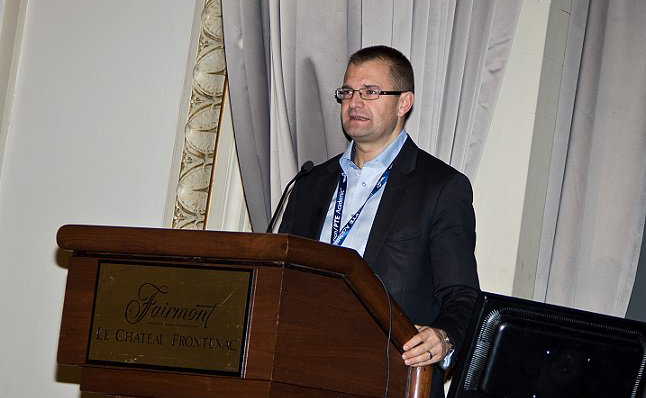 Samuel Vetrak, CEO of StudentMarketing and a global international education strategist was presenting during Languages Canada Annual Conference 2017 in Quebec, Canada. He delivered a global perspective and an in-depth comparative analysis of ELT sector (top destinations, top source markets with future outlook specifically focused on Canada). In the final part, Samuel showed successful case studies of various recruitment and marketing initiatives done by study destinations across the globe. If you are a study destination marketer or an international recruiter, feel free to contact us here and we will be happy to arrange an exploratory meeting. What are agency adoption rates by U.S. universities two years after NACAC's decision to permit the use of incentive-based agents in international student recruitment? Bridge Education Group, Colorado Mesa University and StudentMarketing shared insights, perspectives and findings, based on comprehensive research. The resulting report provides data and insight on such topics as transparency, "double-dipping", public policy, forms of compensation, master agents, agency certification, fraud, and new data on the perspective of international students on agencies. Samuel Vetrak, CEO of StudentMarketing, a global market research, intelligence and strategic development consultancy helping investors, funds, developers or operators in engaging within student housing and micro living asset class, had a keynote presentation at the PropertyEU's Investment Briefing on Student Housing and Micro Living. 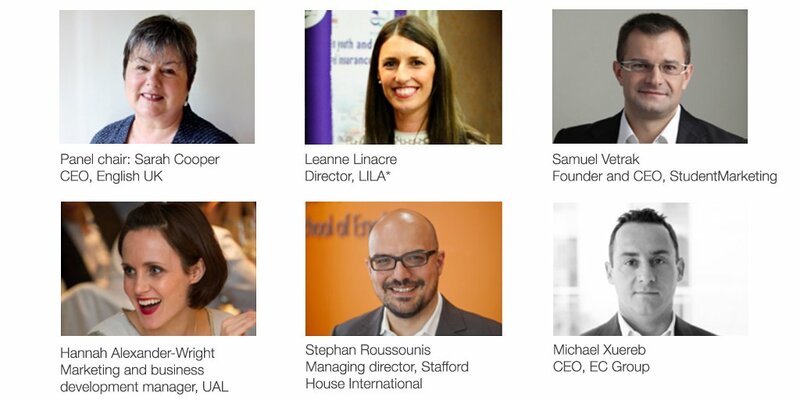 The presentation was followed by the panel discussion where some of the leading UK & European student housing investors and fund managers shared their views on recent development and 2017 projections. The panel discussion can be watched here. If you are looking for investment opportunities or need to justify your investment-related decisions, feel free to contact us here and we will be happy to arrange an exploratory meeting. 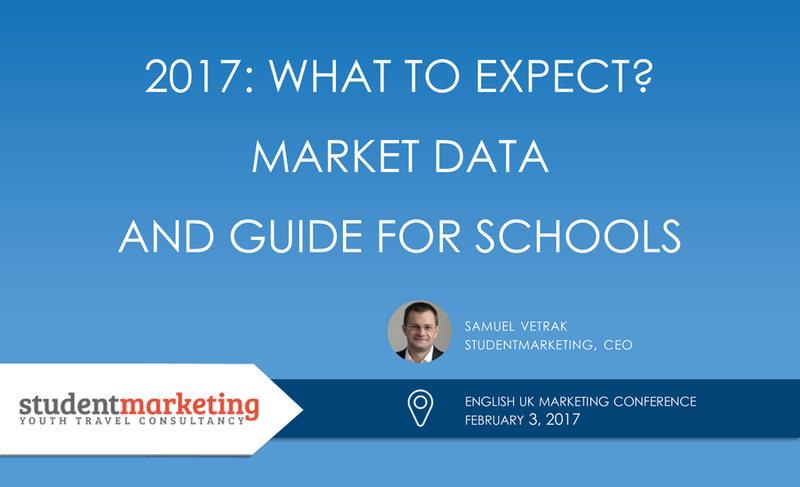 The session was designed for English UK member school representatives to benefit from market data and make informed decisions. Industry strategist and StudentMarketing CEO Samuel Vetrak presented the newest data on trends, mobility, demand levels, preferred programmes, source market performance and other useful inputs available for the better performance of schools. Do not miss this unique opportunity to enrich your 2017 strategy and request your copy here. If you are interested in what Samuel had to say about current UK ELT's market, feel free to contact us here and we will be happy to arrange a call. 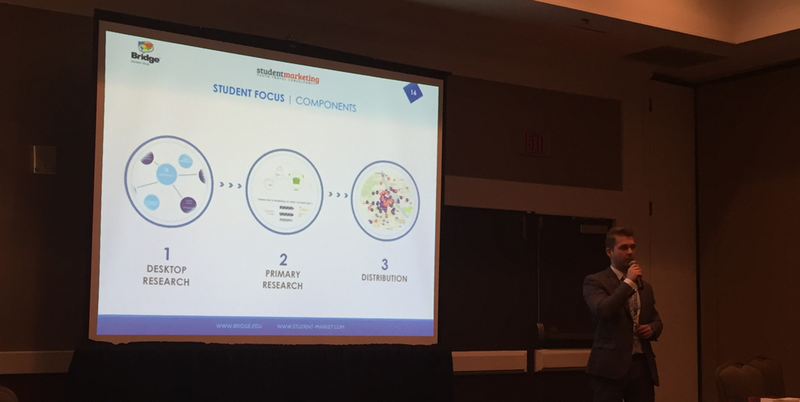 Jean-Marc Alberola, President of Bridge Education Group, and Patrik Pavlacic, Head of Research at StudentMarketing, presented at the AIRC's 8th Annual Conference in Miami, Florida. The presentation provided an insight on the pace of adoption of agencies as a recruitment channel partner by U.S. universities, as well as how specific market forces and public opinion are influencing how this adoption takes place and to what degree it differs from practices in other countries. 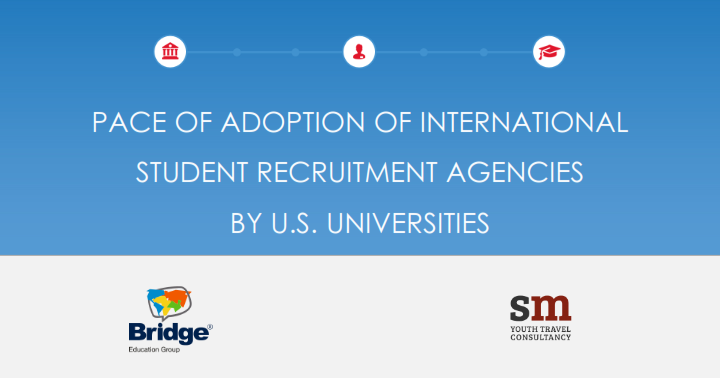 This research provides U.S. institutions, agencies and other stakeholders with unique insights, transparency and analysis of specific practices, as well as a balanced and unbiased view on the key issues and concerns surrounding the practice of using international student recruitment agencies. Note: This presentation was also part of the ICEF North America Workshop in Miami (5 Dec 2016). Europe’s first large scale research into student housing was presented, followed by a discussion on how student accommodation can boost student mobility. What does generation Erasmus need, and how can universities and housing providers up their game? Please contact us here for more details. This session is for everyone who wants to make an informed decision affecting 2017 bookings and enrolments. After a year, industry strategist and CEO of StudentMarketing Samuel Vetrak presented the newest data on who’s hot & cold among destinations; what the source market performance is and where you can find alternative sources; he also shared the upcoming trends in international student recruitment and forecasting projections that will enable you to understand market dynamics and set a proper 2017 strategy. This must-attend presentation is available to the ICEF Berlin Workshop delegates only and will not be delivered elsewhere. unsympathetic visa policies, a weakening overall demand for learning English abroad, a seismic structural shift in the maturing global industry and a more demanding and ever-evolving student profile. 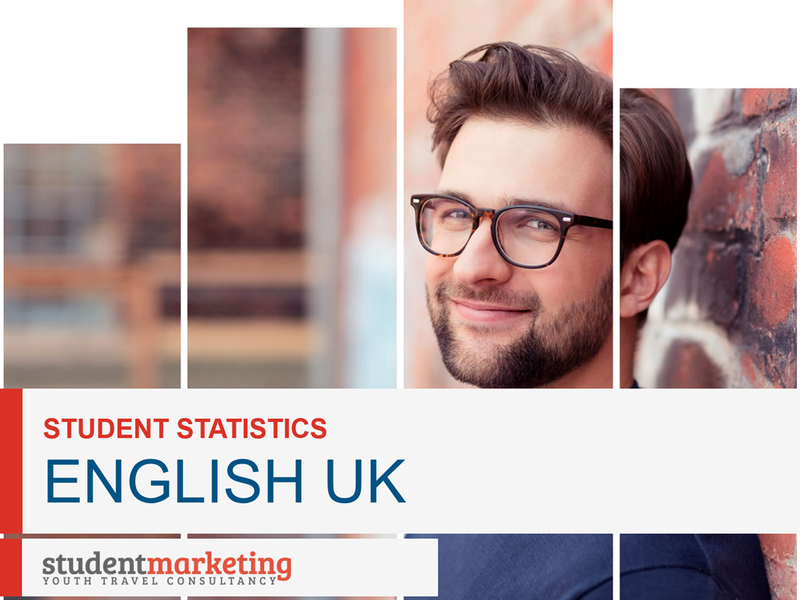 The expert panel explored and gave colour to recent statistical research conducted by English UK and its insight partner, StudentMarketing. Panellists considered how the UK ELT sector could best rise to meet the challenges that it currently faces, and what the future holds for the world’s oldest language learning destination. Destinations Meet Student Travel is an initiative of ICEF, a leading international education industry platform, and StudentMarketing, a key youth and student travel market development company. 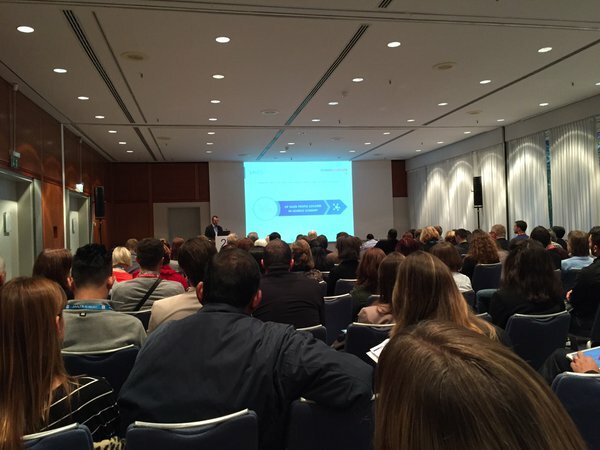 This event, showcasing the impact of student travel on destinations and the benefits from it, took place on the 30th October 2016 as part of the ICEF Berlin Workshop, the leading networking forum for international education, attracting approximately 2,500 professionals from over 90 countries. The event was officially open by Markus Badde, CEO of ICEF, who was followed by a keynote speaker, Eunji Tae, Knowledge Network Coordinator of UNWTO. Ms. Tae picked up on recent industry trends and UNWTO's projects within student travel - its importance and benefits. Following that, Samuel Vetrak, CEO of StudentMarketing, and Rod Hearps, VP of Asia-Pacific, ICEF, have shown the economic and social impacts of student travel on destinations along with practical examples & case studies. This was broadly extended by three excellent destination speakers: Jane Favaloro of StudyMelbourne, on a city level; Guido Schillig of Southwest England on a regional level; and Ute Haug of Education New Zealand on a country level. All three experts featured how their destinations as well as subsidiary organizations managed to recognize student travel as a relevant and impactful tourism segment and what marketing activities they have taken and benefited from so far. The forum was concluded by an interactive session where all participants shared their view on this topic, be it City of Amsterdam, The Hague, StudyCairns / Study Queensland, ACPET, English Australia, Education South Africa, Education Malaysia or US Dept of State. For more information on the forum, please contact us here or read a summary article from ICEF Monitor here. Samuel Vetrak, CEO of StudentMarketing, and our Head of Research, Patrik Pavlacic, participated at the SYTA Annual Conference in Orlando, U.S. During the four consecutive sessions, Vetrak presented three in-depth analyses summarizing the key findings from the Student & Youth Travel Digest, a first-of-its-kind global study quantifying impact of travel on students and the travel industry; and gave one special session on global student trends. inbound travel to the U.S.
outbound travel from the U.S.
Vetrak shared insights from the international tour operator survey data (inbound), U.S. teacher survey responses (domestic & regional) as well as teacher and tour operator data on outbound travel from U.S. In the last session, Vetrak gave a global market intelligence report on youth, student and educational travel market based on his company's experience with a variety of organizations worldwide. 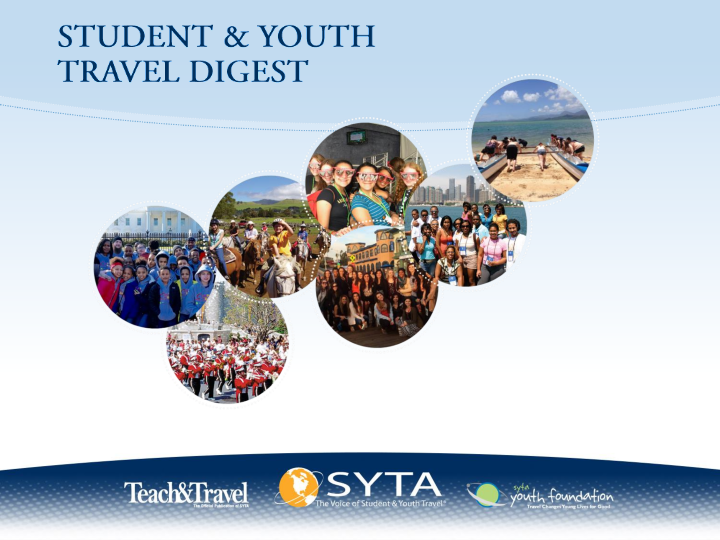 For more information on the SYTA's Student & Youth Travel Digest, please click here or send us an email. WHAT IS THE PACE OF ADOPTION OF INTERNATIONAL RECRUITMENT AGENCIES BY U.S. INSTITUTIONS? What are agency adoption rates by U.S. universities two years after NACAC's decision to permit the use of incentive-based agents in international student recruitment? This session summarized research conducted by Bridge Education Group, an ESL pathways provider, and StudentMarketing, an UNWTO Affiliate Member and research specialist. The intent is that this research will provide U.S. institutions, agencies and other key stakeholders with unique insights, transparency and analysis of specific practices, as well as a balanced and unbiased view on the key issues and concerns surrounding the practice of using international students recruitment agencies. For any questions, please send us an email. 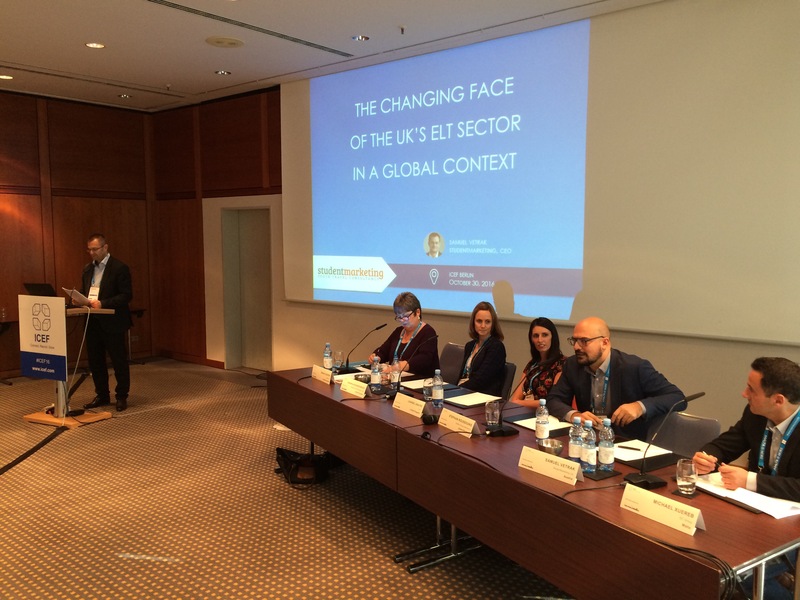 The session featured a detailed analysis of the latest edition of statistics about the UK ELT market, followed by a picture of what’s happening globally. This year, the report introduced more business intelligence to English UK members. In this 90-minute panel discussion with Q&A session, Samuel Vetrak, CEO of StudentMarketing, has presented recent ELT trends on junior as well as adult segment. He has also delivered a detailed year-to-year comparison of performance of top 20 source markets from both, UK and global perspective. At the end of his presentation, Samuel looked closer on what schools can do to adapt on the recent industry changes, with specific focus on market intelligence, pricing, sales infrastructure and marketing strategy. The panel then continued with industry specialist Jackie Kassteen presenting a more detailed overview on international marketing and alternative way to reach new markets based on the trends highlighted by Samuel. The entire session was moderated by Matthew Knott, an editor of Study Travel Magazine. For more information on this session, please do not hesitate to send us an email. CEO of StudentMarketing and a renowned industry strategist, Samuel Vetrak, has shared his long-term experience from helping dozens of institutions with marketing of their programs in source markets. How to best succeed there, what works and what doesn't, what the best time and approach to take is, where to go, what mistakes to avoid or what the tricks and difference makers are. If you missed his presentation, send us an email, learn from his experience and use it for your own benefit. 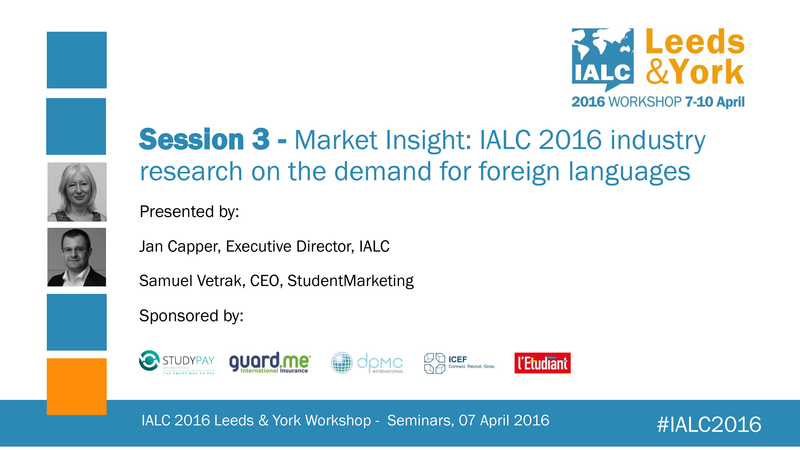 IALC 2016 industry research, presented at the 2016 IALC Workshop in Leeds & York, unveiled a unique benchmark of foreign languages representing 236,000 students. Demand development for German courses are outpacing French and Spanish. For more information, please download the IALC 2016 Study Travel Research Report here. The 6th year of ITB Berlin’s Youth Travel Summit was addressed by Mr Taleb Rifai, UNWTO Secretary-General. He said that youth tourism needs more recognition from governments, as youth travellers are a vital source of innovation and better connect to the local community. Video record will be available here in April 2016. You can find more details on Youth Travel Summit 2016 here. For any other information, do not hesitate to contact us at media (at) student-market.com or +436506124527. 2016: WHAT DO CANADIAN INSTITUTIONS NEED TO BE PREPARED FOR? We live in challenging times, where making informed decisions is vital to the success of your institution. Industry strategist Samuel Vetrak, CEO of StudentMarketing, through brand new data, market trends and forecasting projections supported by expert insights will deliver a highly anticipated answer on where the market is heading and what you should be prepared for. The session will be specifically focused on the needs of Languages Canada’s Annual Conference participants. Let us know if you are interested in getting more details on how 2016 can affect your institution and what you can do to boost your business. UK ELT IN 2015-2020: WHAT TO BE PREPARED FOR? Language travel industry is maturing; Demand levels are peaking; Margins are becoming more difficult to maintain; Competition is intensifying, within the UK itself and with other destinations. What should UK marketers do to cope with the new stage of strong buyers? What markets will deliver in the future? Are we entering a new stage of market development? This bespoke session is prepared for UK marketers to prepare their marketing efforts for the challenging times ahead. Would you like to evaluate your recruitment & marketing strategy? Then click here to arrange a complimentary meeting with us. What have we learnt from recent development in the US and Canada? How do they stand in comparison with other study destinations? And what about source markets? Are there any new rising stars affecting the usual suspects? 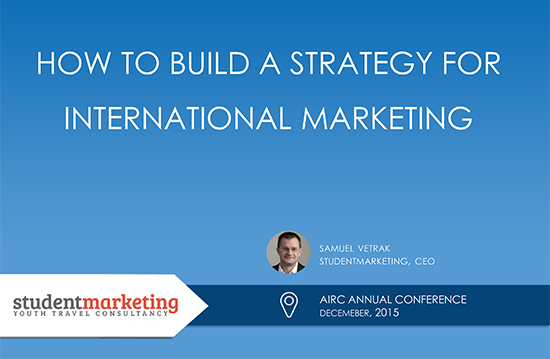 Based on the latest market trends, Samuel Vetrak, CEO of StudentMarketing and renowned industry strategist, identified and advised US and Canadian institutions on what they should keep and what should be rather left out when creating a successful 2016 international student recruitment and marketing strategy. Are you having a hard time entering new markets? Are you struggling with marketing channels, despite them often not working as they should? Industry strategist Samuel Vetrak shared his 14 years of experience in international recruitment at this mini-session. It was the opportunity to discuss your marketing with him, and find out what specific steps your institution needs to take to stay ahead of the curve. Have you missed his session? Let us know! What are agency adoption rates by U.S universities two years after NACAC’s decision to permit the use of incentive-based agents in international student recruitment? The session summarized preliminary results of research on this question conducted by Bridge Education and StudentMarketing. The full research results will be available in early 2016. 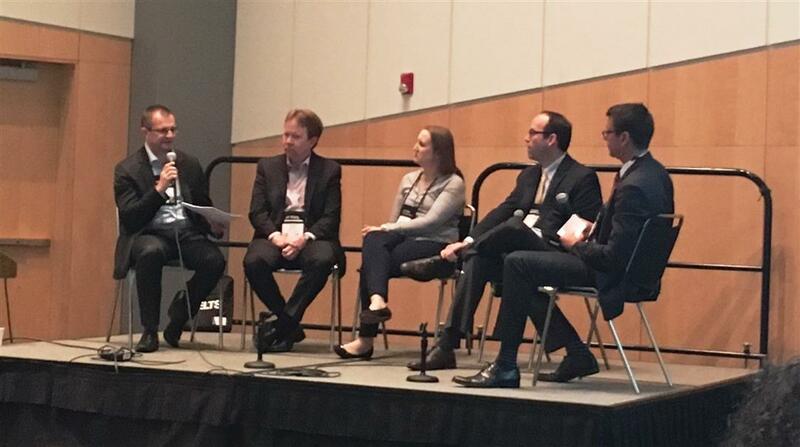 StudentMarketing CEO Samuel Vetrak was one of the contributors taking part in a panel discussion about Destination Marketing. Samuel set the scene by presenting the higher education sector in figures as well as commenting on key international student mobility trends and market developments. Sam focused on what the ambitions of destinations are and what they are doing to increase their international student population. Are you interested in getting more details how StudentMarketing is helping destinations and investors to succeed in student travel? Then write us here to learn more and arrange a complimentary meeting with us! This session helped schools, providers and agents to stay ahead of market developments. Brand new data from hundreds of sources, trend and forecasting projections, as well as insights from an industry strategist, provided essential acumen into where the market is heading and what to be prepared for. This presentation is available to The ICEF Berlin Workshop delegates only and will not be delivered elsewhere. Are you interested in receiving more students? Then write us here and we will be happy to arrange a complimentary meeting. STATE OF THE LANGUAGE TRAVEL INDUSTRY - IS YOUR FUTURE SAFE? 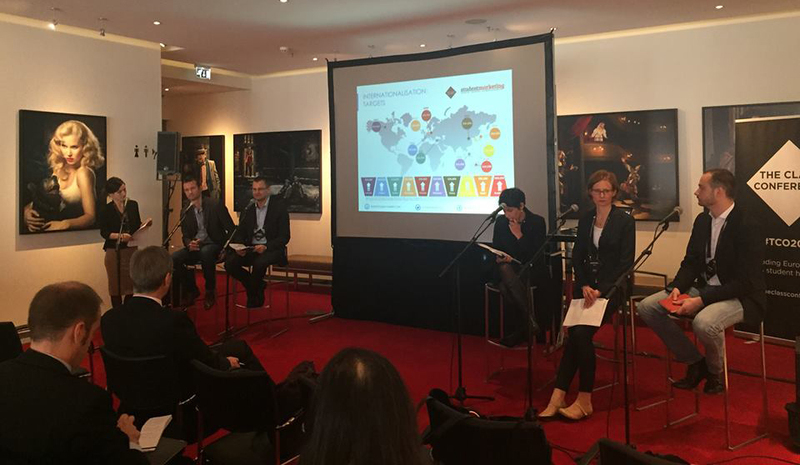 In 2015, the International Association of Language Centres (IALC) commissioned unique industry research and staged a panel debate on the language travel industry lifecycle. In total, 472 agencies from 72 countries participated in the research, which sheds light on the programme preferences of language travel students, demand for different languages, agent-provider relationships and key industry trends. This seminar, with presenters Jan Capper (IALC), Jean-Marc Alberola (IALC) and Samuel Vetrak (StudentMarketing) brought this important research and discussion to a wider audience. What sets Hawaii apart as a study destination? What can Hawaii and its education institutions do to increase its perception as a world-class study destination? Samuel Vetrak, CEO of StudentMarketing and a renowned advisor to study destinations and education institutions, showed Study Hawai'i Consortium how they can market and recruit themselves effectively. He also shared engaging thoughts in terms of channels, locations and resources to Hawaii's unique environment. Is your destination interested in increasing its international student population? Then write us an email and we will be happy to arrange a complimentary meeting to identify and elaborate on your needs. U.S. institutions are now looking for the best ways to reach international markets in order to attract more students. Samuel Vetrak, StudentMarketing CEO and a renowned expert in international education, has shared the best practices in both recruitment and marketing, based on multiple case-studies and years of experience in this segment. The audience at NAFSA Region XII in Honolulu, Hawaii has learnt how to set a rigorous recruitment and marketing strategy to increase their international student population and got inspired by success stories of other industry organisations. Have you missed Samuel's session? Then click here to request your copy of the presentation with an audio podcast included! > The world's political-economic momentum is continuously shifting towards Asia-Pacific with the international education industry following suit. In his presentation, Igor Skibickij, Head of StudentMarketing's China office, shared the latest trends and developments in the markets of China and South-East Asia, while also providing practical tips on how to conduct business in these rapidly growing markets effectively. > Whether you are already active in international student recruitment, or just planning to do so, learn from renowned industry strategist Samuel Vetrak, who revealed the best source markets in the upcoming marketing season. In addition, Samuel put these countries into context with practical guidance for successful education marketing in these countries. The discussion featured proven tips and tricks on when and how to do marketing, business negotiation customs or strategies for both B2B and B2C. Did you miss his seminar at The ICEF Higher Education Workshop, but are striving for more international students? WHAT DO YOU NEED TO KNOW ABOUT MARKETING IN BRAZIL? > With growing demand for study abroad programmes and further expansion of the generous Science Without Borders scholarship scheme, Brazil is a lucrative market for language and higher education providers alike. In 2013, Brazilian students generated more than 823,000 student weeks in the global ELT market. Preliminary 2014 data suggests that Brazil grew for the majority of destinations and thus reconfirmed its position as the 5th strongest source country worldwide. However, for UK-based language schools, 2014 was a challenging year. 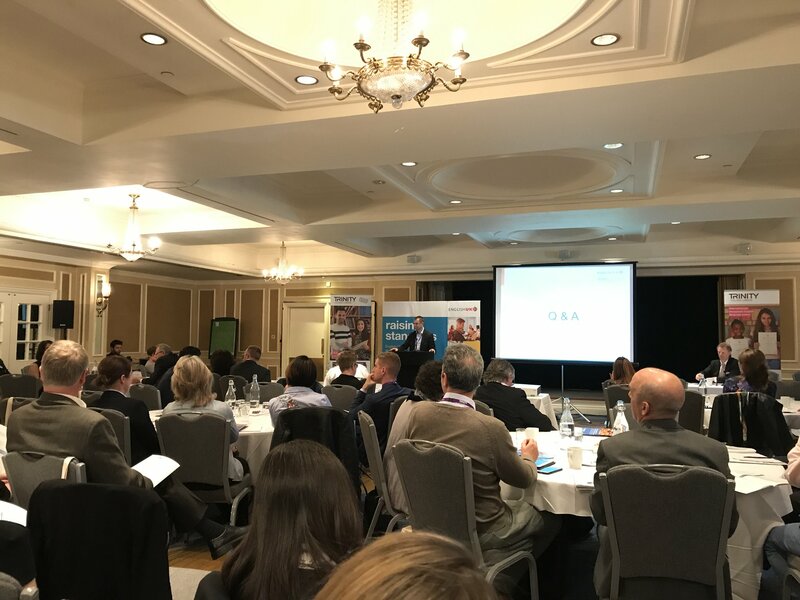 In light of the above, this session provided insights into how to drive sales in an ample market where agent bookings are dominated by two dozen education agents. Samuel Vetrak, Founder and CEO of StudentMarketing, elaborated on how to market your institution in Brazil and outlined techniques that deliver the highest ROI. Are you interested in empowering your international recruitment and marketing in Brazil? > Brazil is not as easy of a market to succeed in as before. For some institutions, new scholarships and funding schemes open doors to new recruitment opportunities. However, unique local players, such as event organizers and travel agents are entering the market, making it more competitive and no longer suitable for a shotgun approach. How can institutions succeed in this new environment? Mexico, on the other hand, now accounts for 41,000 students abroad, with the growth mostly being driven by a bump in the number of ELT students abroad. What are the best cities for international recruitment and marketing techniques that allow for a sustainable influx of Mexican students? What works and what doesn’t in the market’s current settings? > During last year's session, Samuel Vetrak, the founder and CEO of StudentMarketing, revealed the most promising English language travel, K-12 and Higher Education markets for Canadian and US educational institutions. Did you miss it or are just looking for an update? We have good news then. > Which K-12 markets are best for international student recruitment? What is the most effective approach to ensure success for Canadian institutions in these areas? Samuel Vetrak, CEO and renowned industry strategist for international student recruitment, identified the best K-12 source markets of international students for Canadian institutions, while also shared marketing experience and proven techniques you should be familiar with when developing long and short-term strategies to capitalize on these markets. > The recent 12% bump in the number of international students proved a turn in market development in New Zealand. Australia continues to attract a growing number of international students, the country’s ELT sector recorded a strong rebound especially in 2014. > 56% of agents believe independent and boutique chain schools are of higher quality than chain schools, showed research commissioned by IALC. A first of its kind research was presented at the International Association of Language Centres (IALC) 2015 workshop in Rouen, France. The presentation was hosted by IALC Director Jan Capper and StudentMarketing CEO Samuel Vetrak, who cooperated on the research. Responses from 472 agencies from 72 countries, representing more than 230,000 language travel students, were gathered from December 2014 to April 2015. 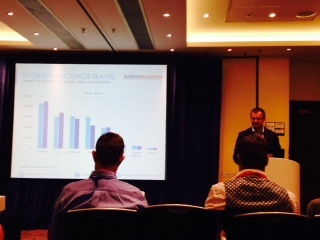 The aim of the industry-wide research was to analyse the current state of the global language travel market. Direct communication with experienced agency representatives also provided an unparalleled comparison of independent schools and boutique chains on the one hand, and chain schools on the other. A substantial amount of value was also provided to the project by its high participation rate. Agencies offered their insights into the future trends that are expected to shape the industry in the years to come, thus contributing to a representative and quantified analysis of topics that have, up to this point, been discussed in general terms only. RUSSIA - MARKET AT CROSSROADS? > For some time, Russia has been knocking on the door of the top 10 source markets worldwide, with some 110,000 Russians studying abroad every year. Today, there is a hot debate as to whether Russia’s current political climate will halt the promising development that the market witnessed in the not-so-distant past and whether there are any resulting shifts in customer preferences. Samuel Vetrak, CEO of StudentMarketing, revealed and commented on the current happenings in the country as they relate to studying abroad. 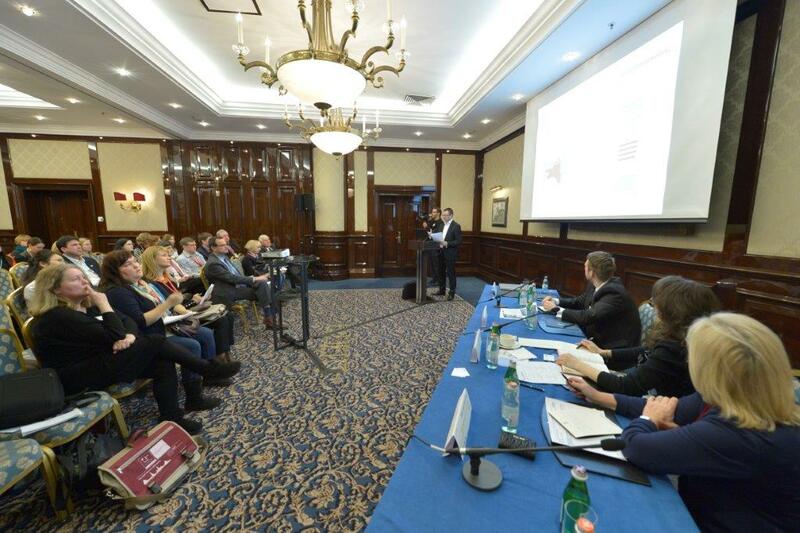 The session featured the most recent country profile, as well as first-hand results of in-depth interviews with a number of Russian education agents. > As Youth Travel continues its double digit growth, making it the fastest growing and most reliable market sector in the travel industry, the need to engage with and win this segment has never been greater. Over the past several ITB Youth Travel Summits, Sam Vetrak has documented the power of this segment; tracked its behavior and spending patterns; and brought leading youth travel destinations and stakeholders to the stage to share their experiences. This year Sam Vetrak took us a step further, providing practical tips on how to successfully market to youth and student travel consumers and bringing you examples of successful campaigns by top youth travel brands and destinations to inspire your youth travel strategy. > The presentation was based on research of French language market conducted by StudentMarketing in cooperation with Languages Canada. The secondary research was focused on collection and analysis of existing data, notably in three main areas - Use of French language worldwide, Research on French language schools worldwide (global supply) and Number of French language travel (FLT) students worldwide. > With an immense sending power of 100,000 English language students abroad annually, China represents the 4th largest source market worldwide. Moreover, the revenue opportunity in China has climbed to US $230 million in tuition alone. The market’s Y-O-Y increase represents 6.5%, making China not only one of the fastest growing, but also one of the most sought after markets in the industry. FUTURE OF ENGLISH PROGRAMS: WHERE IS THE MARKET HEADING? 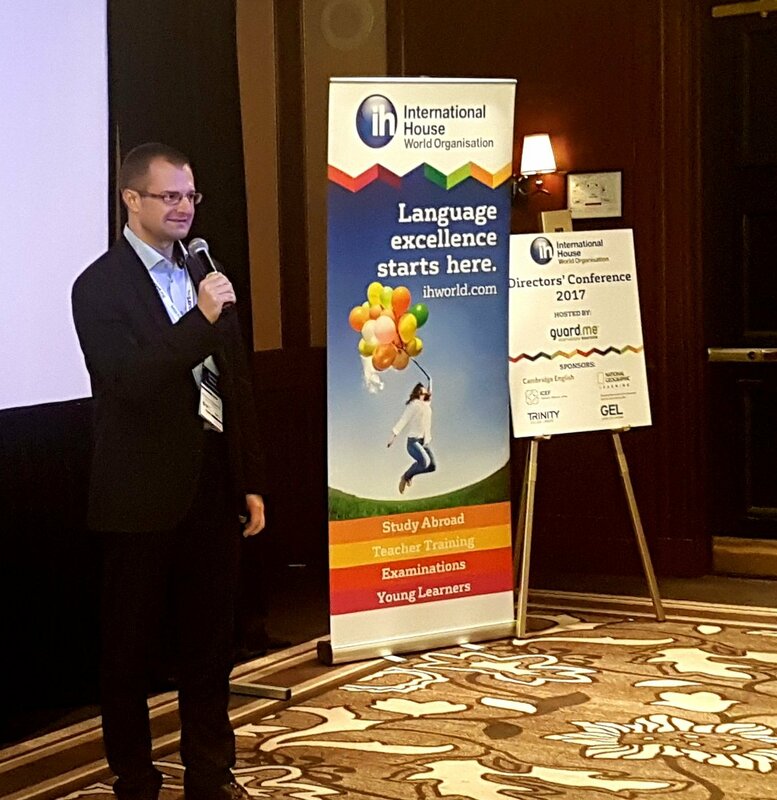 > In his first 2015 presentation held at EnglishUSA PDC in San Francisco, our CEO Samuel Vetrak summarized what specific information from the most recent market intelligence on international education you should be focusing on. Explicit emphasis was placed on the rapidly evolving Pathway market segment, not-to-be-missed source markets, and highly-efficient marketing and recruitment techniques. > Which markets are best for international student recruitment? And what is the most effective approach to ensure success for US and Canadian institutions in these areas? Samuel Vetrak, CEO of StudentMarketing and renowned industry strategist for international student recruitment, identified the best source markets of international students for US and Canadian institutions, while also shared marketing experience and proven techniques you should be familiar with when developing long and short-term strategies to capitalise on these markets. HOW TO MAKE PROFIT IN 2015? > What steps should a business take to break through in the coming year? What knowledge is critical to providers’ success in 2015? We live in a mature industry that features only 2% annual growth. Businesses often struggle with fierce competition and low margins. Several strong markets are in political unrest and under-performing. All making it difficult to succeed without effective approaches. Samuel Vetrak, CEO of StudentMarketing and renowned industry strategist for international student recruitment, shared the newest marketing data and talk about techniques that deliver double-digit annual growth. The session included the most recent and pertinent market intelligence on preferred programmes, source markets, price levels, and booking channels. > What is youth travel? Why should a destination invest into it? How can you tap into a $203 billion market? These (and many other) questions were answered by StudentMarketing's CEO Samuel Vetrak at UNWTO HQ in Madrid, Spain. In the session especially prepared for DMO and CVB representatives, he revealed that the value of the youth travel market is still 43% bigger than the gaming industry, cruise industry and NHL clubs combined. Not to mention that conservative estimates see youth travel at the value of $320 billion by 2020. He then explained that there are several ways to succeed in getting as many youth travellers for your destination as possible. First, you should create a strategic marketing plan based on thorough market research and intelligence, then build partnerships, provide scholarships and internships, support low-cost flights, organize youth events, trade missions or familiarisation tours, all essentially accompanied with online marketing activities, incl. social media. As Vetrak pointed out, the destination's recruitment and marketing activities should not avoid an intensive cooperation with buyers, as the world's 16,000 youth and student travel agents are ready to send thousands of new youth travellers to your destination. If you would like to secure more travellers for your destination and thus make your life easier, contact us or sign up for our newsletter, which offers free advice directly to your inbox. To stay ahead in today’s business climate, companies must be able to respond and adapt to developing industry trends, taking their cue from current and potential customers. Over the past years, there has been a steady shift from traditional leisure travel towards an experience-oriented form of travel that enriches young people's lives both personally and professionally. In order to better understand the uptake of educational travel, Samuel Vetrak, founder and CEO of StudentMarketing, explained next generation travellers' motivations and drivers behind this development. Samuel demonstrated what kind of product and experience they seek and how businesses can attract this target group. Interested in more details? Send us your request for the presentation and we will be happy to be of service. The markets of the future represent a not-to-be-missed opportunity for educational institutions seeking to expand and obtain success in the international Higher Education sector. In order to achieve this goal, educators must acquire a thorough understanding of the emerging source countries and essential factors that shape development in this rapidly growing sector. 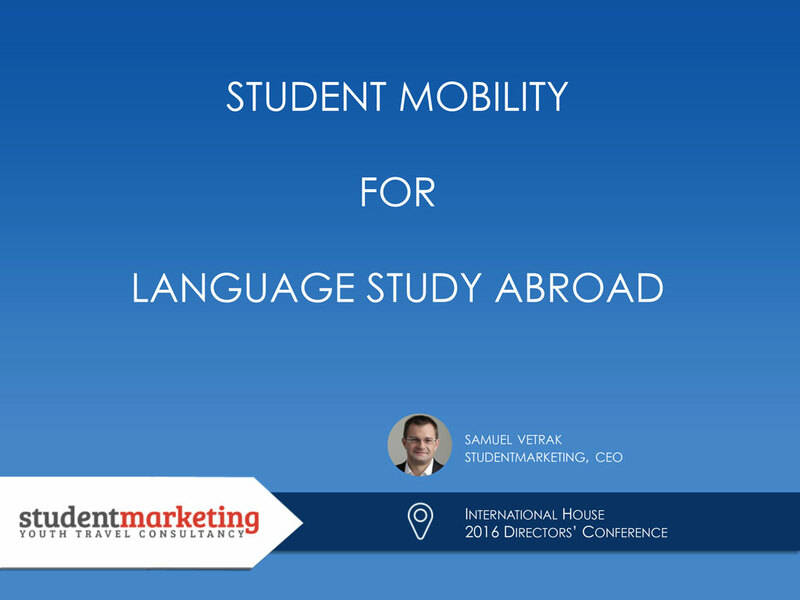 That is why Samuel Vetrak, founder and CEO of StudentMarketing, went into detail exploring which markets will produce the most international students and what should be taken into consideration when engaging with these source countries. Building on the current figures on student mobility and trends, Samuel outlined where lie the opportunities for international growth. WHAT DO YOU NEED TO KNOW ABOUT MARKETING IN CHINA? When StudyWorld hosts youth travel professionals, you know that summer is over and the period of hard work is beginning. 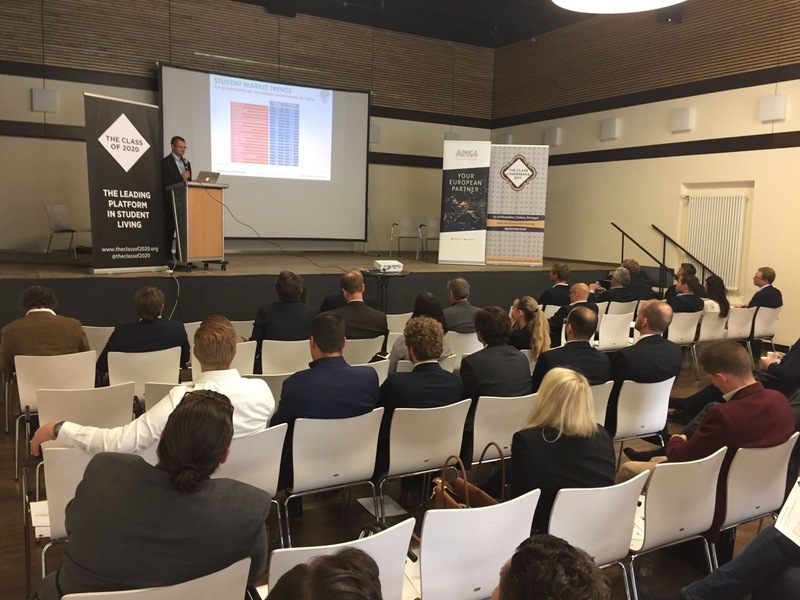 Samuel Vetrak was on-site to deliver a presentation on what is essential to learn about China when engaging with this market. Elaborating on the boom in outbound tourism, which is expected to grow by an additional 100 million tourists by 2020 and therefore double in size, he explained what effect is it going to have on student mobility from China. Regarding educational travel, Vetrak has brought in some new and exciting findings. For instance, 87% of Chinese parents are willing to fund study abroad. This goes hand in hand with increasing consumer expenditure on education, facilitated by a 63.3% surge in disposable income between 2007 and 2012. He also revealed that one third of Chinese ELT students study in the USA (more than 30,000 students). The leading position of the USA is present in higher education too, as American institutions accommodate 30% of all Chinese tertiary students - twice as much as the market share of the second-place Japan. Vetrak continued by providing the audience with a step by step marketing guide as to what works and what does not, outlining the market cycle, local business negotiation customs, and how China's unique features translate into business in the Chinese agent market. The presentation ended with a series of recommendations for educational institutions. Even if many of us are busy with planning our summer holidays and selection of the best possible destination, Samuel Vetrak went on for another trip of ongoing spring 2014 season. This time, he presented at a conference organized by Atout France at Chateau Clos-Lucé, located in a beatiful valley of the river Loire, the halfway of the road Tours - Bourges. His main aim was to share what are the best source countries for France in a growing youth travel. Also, it turned out that France is only at fifth place in the list of top 5 European destinations, with 6.9% market share, as opposed to 9.6% market share of leading Germany. He also revealed that France is the second best European source market, sending 7.9% of youth travellers cruising around in Europe. Germany takes a leading position again, this time with huge, almost 10% gap, rated at 17% of a source market comparison. Samuel Vetrak presented an overview of CAPS-I market report based on research findings on French language market opportunities. In brief, he talked about demand for and enrollment in French high school programs in Canada. Then, he added what might be the student preferences and what agents had to say about the Canadian K-12 potential in source markets. He also briefly summarised the recently organized trade mission for CAPS-I members that took place in Austria and Spain. As he described, the mission was a great success with 19 members out of 7 Canadian provinces meeting 40 top quality agents in Vienna and Madrid combined. The success of mission, supported by the respective embassy representatives, is underlined by 79% of participants being extremely satisfied. Panel session with Michael Carrier, Tony Millns (Chair), Anna Searle and Samuel Vetrak. This session was a well-received at the World Islamic Education Forum last year and has been updated and adapted for this year conference. An expert panel chaired by English UK CEO Tony Millns looked at global trends in English language and the way that English creates economic development and financial returns. Michael Carrier of Cambridge English looked at the role of English in employment, Anna Searle of the British Council assessed the research carried out by the BC and others for their exhibition on the global role of English last year, and Samuel Vetrak of StudentMarketing looked at the trends across the world and what they tell us for the future of English language learning. Everyone knows about China, South Korea or India. But what lies in recruitment beyond traditional source markets? What markets are showing the highest potential in terms of current and future growth? By looking at enrollment trends in both the USA and Canada, as well as pinpointing specific opportunities from these source markets, Samuel Vetrak, CEO and founder of StudentMarketing, delves into an evidence-based prognosis and analysis of selected industry sectors. This presentation is for anyone looking to receive up-to-date knowledge in order to successfully utilize their own data-driven international marketing. If a term "big data" means a collection of large and complex data sets, then, believe it or not, this particular presentation represents a practical handout derived from the big data of Higher Education, Language Travel and K-12. Having presented down under, in Sydney, Australia, StudentMarketing's CEO Samuel Vetrak revealed the following across-sector finding. Besides traditional major markets such as China, India and Brazil, countries of Russia, Turkey, Spain, Mexico and Venezuela present highest mid-term growth opportunities for Australian and New Zealand institutions to grow student numbers. If you are interested in more data, down to each of the presented sectors, and thus get a crucial advantage over your competitors, we will be happy to be of service. The youth travel sector generated US$203 billion in revenue last year - twice as much as the global video game industry. 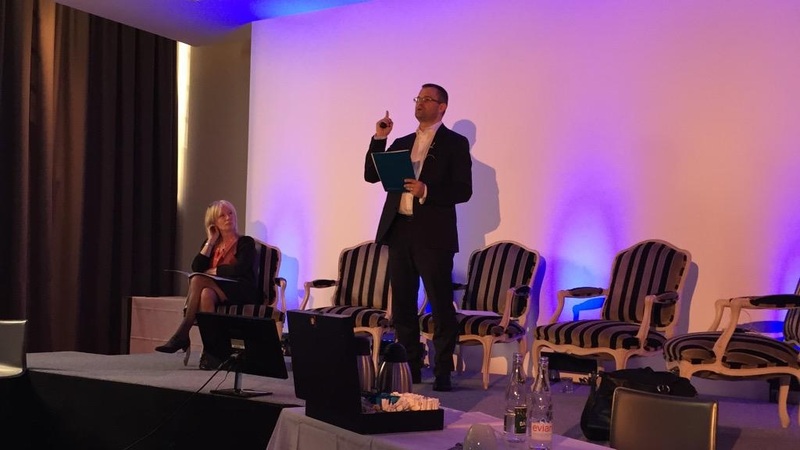 That’s why it’s so important that travel organisations start planning now in order to benefit from this booming market, StudentMarketing CEO Samuel Vetrak told delegates at ITB Berlin last week. 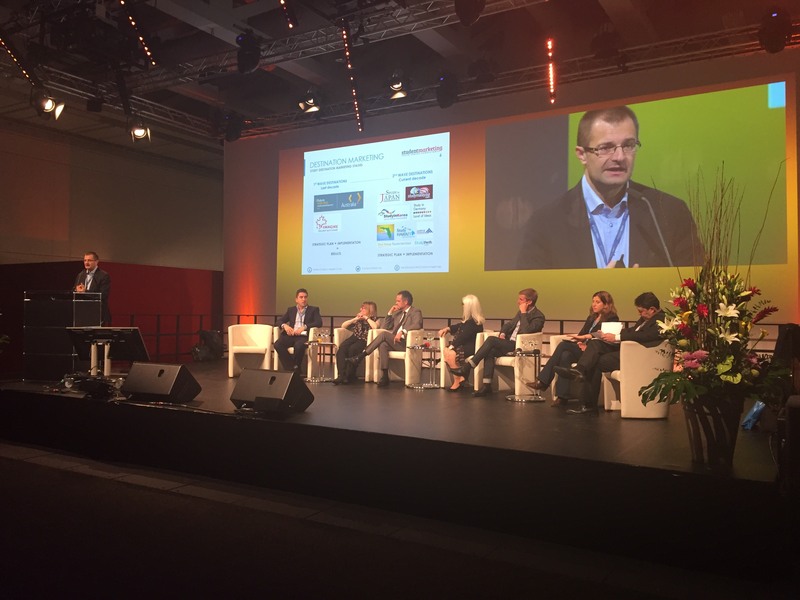 Vetrak was one of eight leading destination experts who took part in what is now an annual seminar on the latest trends in youth travel at ITB Berlin, the world’s largest tourism convention, on March 6. Vetrak emphasized how important it is for destinations to have a strategic plan in place in order to engage young travellers. A natural reflex when times get financially hard are to cut on all expenses, including marketing. In the seminar, the audience of Canadian language schools found out why and how they could go against the current by making smart marketing investments, notably by successfully developing novel markets. Samuel Vetrak, CEO of StudentMarketing, and Guillaum Dubreuil, Languages Canada's Manager of International Affairs and Marketing, described the steps to identify top source markets and discussed the best marketing techniques for Canadian language schools to attract international students from there. One of the key seminar's findings is that Canada, as an ELT destination, is doing well at most source markets, whilst the markets of Italy, China, Russia and Lybia represent the biggest growth opportunities. In the second part of the session, presenters explained why the Canadian schools should market their products collectively. As they said, it achieves significant cost savings, gains local Consulate/Embassy support as well as access to market intelligence and expertise, and, finally, access to high-level contacts otherwise not accessible. As an example of successful collective marketing, they presented the recent Languages Canada Trade Missions and Fam Tours organized in co-operation with StudentMarketing. Are you sick and tired of reviewing vague presentations with useless findings? Are you a busy professional that prefers to get quick, but tangible heads up on what's going on out there? Then why don't you take a look at our recent international education in a nutshell, enriched by the newest figures that will help you to orientate & set the goals for the next few years? The Dubai's presentation provides an educated guess based on intelligence of key student market and tourism institutions on the future of international education. Whilst English language travel (ELT) market is expected to reach 2.5 million of students by the end of 2020 (25% overall increase), Higher Education should proove its dominant position on a global market by reaching 7 million of students, making it 94% increase from current 3.6 million of students. Apparently, despite the crisis still torturing the stock exchanges, a more-than-a-solid and healthy increase is scheduled in the international education. Got interested? Feel free to download our presentation today! Based on our experience, Trade Mission is a coordinated overseas visit by a group of business executives to meet potential buyers or agents in source country, in an effort to stimulate exports from that country, usually organised by trade association and accompanied by governmental authorities. It is suitable for associations or groups of educators, usually taking place in 2 or 3 locations. Trade Mission consists of 4 key features - embassy, seminars, trade and networking that accompany approximatelly 40 meetings with pre-selected agencies. In two Cannes' sessions, Samuel Vetrak, CEO of StudentMarketing, presented the three pillars of inevitable expertise that you need to succeed in the international youth travel market - market intelligence, events and marketing. As he highlighted, market intelligence with marketing is as the umbilical brothers - you can't really divide the two. Whilst in-depth market intelligence can help you to set an ever-important strategy, proper marketing implementation is the one capable of converting it into a success. If you are one of those who have recently struggled to implement the killer marketing techniques within youth travel market, feel free to check Samuel's presentation and get to know why the agents represent the easiest way to succeed, whereas the online marketing aims at the most cost-effective tool. 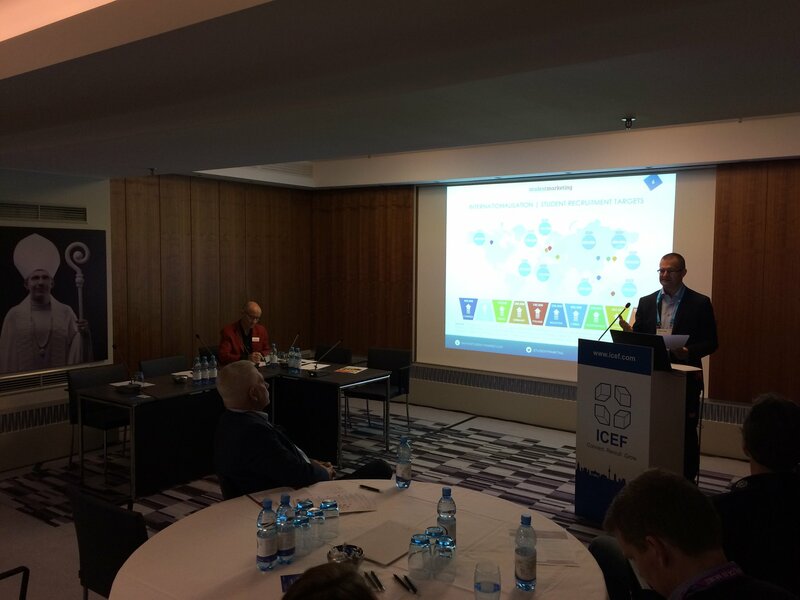 A deep insight on how to improve your educational institution's ROI was presented at the latest ICEF 2013 Miami by our CEO Samuel Vetrak. As shown in the presentation, a total gain of the crisis-resilient international education market is set to be about US $258bn by 2020. Relatively calm waters of destination market shares will endure, with China and Canada teasing traditionally strong U.S. and U.K. markets. However, the everchaning nature of top source markets prooves its reputation yet again, as another guard mounting is going on. The Chinese giant is followed by India, South Korea or Germany, whilst Saudi Arabia, Vietnam or Iran are set to be the most rewarding next-gen markets in higher education. Learn more in our newest presentation on request. STUDENT MARKET OPPORTUNITIES: HOW TO DELIVER WHAT STUDENTS WANT & NEED? 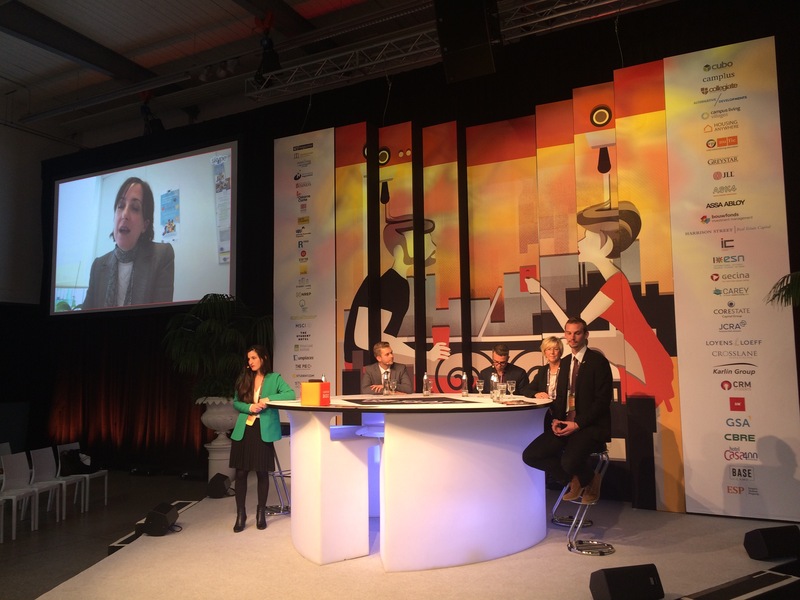 Over 250 participants from around the globe gathered in Amsterdam on November 13 to discuss about the future of student housing in Europe. The main question was – how to deliver what students want & need. 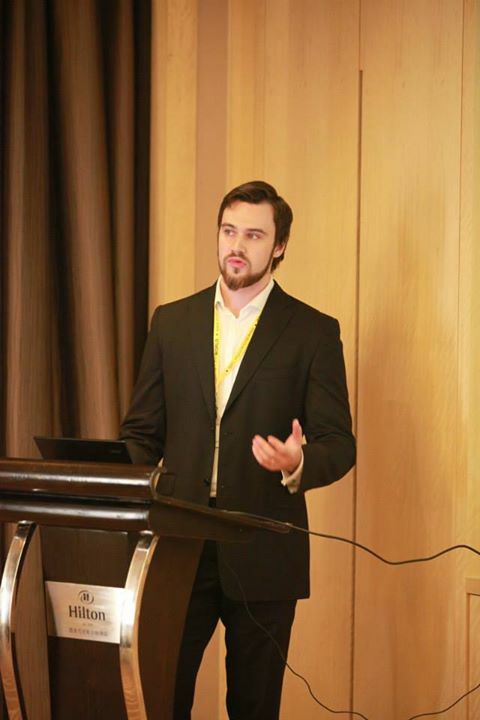 One of the invited presenters, StudentMarketing's CEO Samuel Vetrak, provided an overview with estimated value of student housing and hostel markets, and outlined that there is growing potential of international students by 2020 which is crucial for student housing and hostel providers as well. More data and figures available in the presentation. As one of this season's highlights, Samuel Vetrak unveiled the latest global mobility data and gave an overview of the major trends affecting organisations working in international education. Using sector case studies to illustrate, he demonstrated how quality market intelligence translates into success and delivers excellent return on investment. Furthermore, Samuel explained how institutions can maximise the outcome of their efforts in international recruitment, understand new markets and how to use market intelligence to gain competitive advantage. Joining an industry panel at the 9th World Islamic Economic Forum, Samuel Vetrak debated the role English can play in helping to drive economic development. Commenting on the current trends, Samuel confirmed that English is essential in the development of nations as well as individuals, although a high level of English proficiency is a prerequisite to this. The panel also featured Anna Searle, British Council's Director for English Language and Michael Carrier, Director for Strategic Partnerships at Cambridge English, and was facilitated by Tony Millns, CEO of English UK. Those working in International Higher Education are aware of constant evolution and the rapid pace of change in the sector, globally. Along with the challenges this increasingly competitive landscape presents, there are rewarding opportunities for universities and colleges looking to build or develop international recruitment. Talking to university representatives and higher education specialists, StudentMarketing founder and CEO Samuel Vetrak started the session with an overview of the market and mobility figures. He guided the audience through the trends and market forces that will impact international recruitment over the next two years. In this session, our CEO Samuel Vetrak, shared up to date information and data on the most interesting trends, source markets for new students, and techniques in international marketing. If you are a university, language school or K-12 school that is looking for growth, then the latest findings and marketing experience introduced during this session will be of particular relevance. By 2020 the market will look different. Many challenges and opportunities lie ahead. Understanding the factors that are shaping the future is critical to making the right decisions for ongoing success. The presentation also includes the insights on programme preferences and booking patterns, new source markets and hot tips for the future, unforeseen alliances and surprising partnerships or mergers and acquisitions. The economic and purchasing power of emerging markets is rising. In education travel, emerging markets represent 64% market share of the total international student arrivals (ca 2.1 million). What are the strongest emerging markets in higher education, language travel, and high school sector? What’s the best way to secure enrolments? Samuel Vetrak, our CEO identified the best emerging markets, agencies and strategies to capture maximum business opportunities. StudentMarketing's CEO Samuel Vetrak claims that research means business. Are you asking what is meant by such statement? In his IALC Workshop's presentation, you could find how the research can help schools, associations, governments or investors, why it is important to use it, what are types of market research and how can your institution get the maximum result of research in educational travel market. Vetrak also described the essence of research through several case studies that already proved the following - research does mean business. During the CAPS-I Trade Mission 2013 to Turkey (Istanbul, Ankara), our CEO Samuel Vetrak shown the Turkish market profile focused on international education market - English language travel, Higher education and K-12 sector. Not only he pinpointed key figures and statistics describing the potential of Turkish educational travel market to Canada and some other countries, but he also shown several market trends and predictions by 2020. HOW TO MAKE MONEY IN THE NEW CULTURE OF TRAVEL? LOOK AT YOUTH TRAVEL! Despite slow or no growth in many sectors, youth travel continues to defy market expectations. In 2011, youth travel accounted for 207 million arrivals and generated US$185 billion, making it three times more valuable than the global coffee industry! Trade Missions are effective business platforms designed to meet with pre-screened and carefully selected buyers and local officials in the source country, to stimulate export, create new relationships and gain up-to-date information on recent market development. A great way to initiate the process of breaking into a new market and explore international business opportunities. Educational Travel and especially organized school group travel is often young people’s first international travel experience, and the staging ground for establishing their future travel patterns and preferences. It is an important part of the broader global phenomenon of youth travel yielding over US$200 billion in annual revenues and accounting for over 20% of all international arrivals. What are the lessons to be learned from this pioneering segment of tomorrow‘s global travellers and tourists? Our CEO and COO presented market profiles, student mobility, agent saturation and experiences with working in particular markets (Turkey, Russia, Kazakhstan, Ukraine, Spain, Italy) and shared them with participants of Languages Canada Trade Missions 2012. Our Market Research Manager Patrik Pavlacic presents an insight into language travel - comparison of strongest global markets (English, French, Spanish) and programme prices, reveals how to identify the best suitable agencies in desired markets and gives a potential future outlook. On top of that, he will show the most useful marketing techniques towards agencies - workshops, trade missions, fam tours, edu conferences and online marketing. Therefore, if you struggle in getting closer to agencies, Patrik's presentation is just for you. HOW CAN MARKET RESEARCH DRIVE YOUR MARKET SUCCESS? Together with Marie Hill from Austrade, Samuel Vetrak, CEO of StudentMarketing, presents an impact of market research on your everyday market or marketing activities. Not only he presents why and how to use a market research in 4 Ps of marketing - Product, Price, Place and Promotion, but he also demonstrates it via several case studies that already helped many industry organisations to succeed in the markets by using the research. On top of that, Samuel summarizes some interesting statistics that reveal the average increase of your sales by using a market research - it is be more than you would ever thought.. Except for the useful statistics, Samuel Vetrak shows how important is the role of 26,000 youth and student travel agencies in the world. He speaks about who to engage with and how to keep fruitful relationship. Moreover, he presents some proven ways useful for different industry organisations (e.g. associations, workshop organisers, colleges or language school chains) of how to get in touch with agents. Actually - what are the ways? Trade Missions? Identification and recruitment of best suitable agencies? Expansion of your distribution network? Or agent sales visit? Don't guess, but explore in his presentation that is now available for you to get! Our COO Martin Sulek presents a most comprehensive insight into youth travel that we have ever made. Current and future market trends in statistics, figures or charts enriched by interesting cross-sector comparisons. Did you know that youth travellers do 196 million arrivals per year which makes a youth travel worth US$173 billions?! While this value is still increasing with reaching the estimated US$320 billions by 2020. WOW! Martin also tells you what kind and how many organisations does youth travel have, what are the most preferred and top destinations of youth travellers, where they live when on travel and what are their main problems (e.g. visa, etc.). New business opportunities in inbound language, au pair or work/study programs are presented in Samuel Vetrak's second presentation at this year's SYTA Annual Conference. Just like in his first presentation, Samuel focuses it on comparison of number of students in the USA & Canada coming from top source markets in all three most important youth travel sectors. As a result of his long-term market research engagement, he also provides you with a few of case studies and pinpoint some interesting facts (top U.S. states, cities or SWT sponsors). 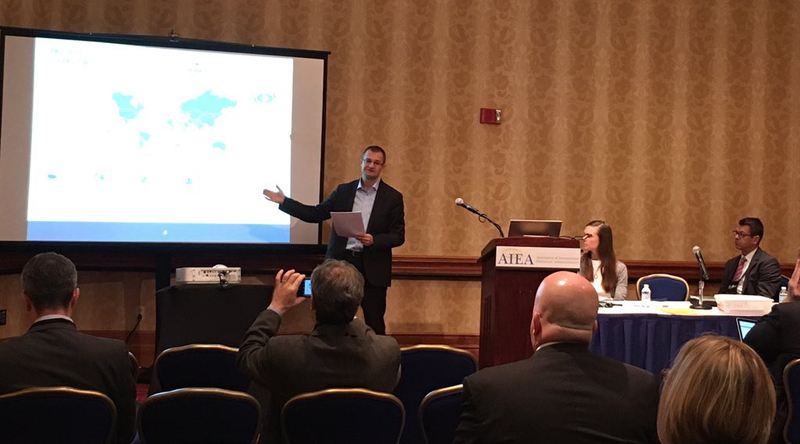 In his first presentation at this year's SYTA Annual Conference in Nashville, Samuel Vetrak, CEO of StudentMarketing, summarizes current statistics and trends in international peer to peer exchange, focused on fast-emerging markets of Brazil, India and China. He shows how many youth tour operators are located in each country and what is the inbound mobility of young Brazilians, Indians or Chinese to the USA. Also, he talks about the upcoming business opportunities in youth travel within these markets and try to outline the overall growth of youth travel by 2020. Led by Samuel Vetrak, CEO of StudentMarketing, the presentation takes you through the landscape of the youth and student travel industry and dispel the most common myths connected to the market. An analysis of the global student market follows, delivering an insight into market size, market value, trends and pinpointing opportunities that lie within this lucrative industry. With this picture in mind, Samuel demonstrates how you can master the basics of market research in order to utilize it for your benefit. With regard to recent market developments, Samuel presents types and volume of business opportunities in emerging countries, and indicate the direction you should take in order to source more business from these regions. Given the largely unexplored opportunities, Samuel also outlines an approach model for institutions that are considering engaging in emerging markets. WHAT IS THE NEXT BIG THING IN YOUTH TRAVEL? Industry professionals are always on the look out for the next big thing; for new prospects that are taking form before their very eyes. Market leaders are those who discern those burgeoning opportunities, and can then identify and seize them. Discover what sectors, regions, and programs are skyrocketing and which show greatest potential for growth in the future within the youth, student and educational travel landscape. Get an overview of the international Higher Education market plus a detailed outline of best practices concerning international student recruitment procedures. Case study included. WHAT ARE THE BEST MARKETING PLATFORMS FOR INTERNATIONAL EDUCATION? Explore the trading and marketing platforms and channels used in international education. Learn how you can best leverage workshops, trade missions, agent sales trips, FAM tours, educational fairs, and online marketing. Austrade’s recently commissioned research on the Czech student market and its view of Australia reveals Czech-market study preferences, decision barriers, and the most effective information and distribution channels to reach them. A webinar, discussing the benefits of market research, provides an overview of WYSE Travel Confederation’s programme and introducing its bespoke Research on Demand offerand demonstrates how market research cost effectively helps you build your business. Most institutions rely on educational consulting agencies to recruit students. With thousands agencies worldwide, how do you identify the best ones to work with? A presentation of the best sources markets for Canadian Language Travel providers, with comprehensive market profiles, numbers of agencies with volumes and best practices. The introductory part provides general information about the language travel market, top destinations for ELT and top nationalities visiting United Kingdom to study English. The core part presents basic procedures and recommendations on approaching and working with agents, including an overview of criteria for tracking and profiling, common marketing techniques and communication styles. An analysis of the Youth Travel Accommodation’s latest industry survey by STAY WYSE includes concrete recommendations for how businesses can use this benchmark to measure their own performance. Global tourism’s moderated paced recovery from 2009 recession levels is set to continue. Europe represents the single largest inbound and outbound market - outperforming mainstream tourism in growth. A review of recent market developments explores current trends and opportunities, and shows operators just how to spot them. An introduction to the benefits of market research and intelligence, this webinar provides an overview of WYSE Travel Confederation’s new research developed for its members. The United States is the world’s largest youth and educational travel destination with over a million international youth and students arriving each year. The additional opportunities for growth and expansion this market holds for US suppliers and DMOs, is examined within the context of global volumes, revenues and trends, as is the potential for US youth travel operators to expand their portfolios with exciting new products and destinations. Case study included. A broad overview of the global youth and student travel market provides the backdrop for the latest comprehensive analysis of the market situation in Eastern European market, its structure and characteristics. Offer special focus on international educational travel and the K-12 sector to discover trends and opportunities. Youth travel accounts for over 20% of all international arrivals. Discover trends and opportunities in this lucrative industry understanding the global market in terms of volume, revenue and the relative position of the various sectors that make up the industry and a detailed examination of agencies’ role in the distribution of youth travel products. Deeper focus on the German market examines the unique relationship of “Jugendreisen” to the broader youth and student travel market. Market intelligence data sourced from tracking and profiling international educational agencies is essential for building your marketing strategies. Learn how to leverage it. With agencies representing the main distribution channel for the Language Travel Industry, the selection of the proper agency is the key success, and one size does not fit all. Learn how to leverage information to shape successful marketing and product development strategies, featuring regional case studies. Youth travel is worth more than top 20 football clubs, music industry and Argentina’s state budget combined. 92% of educational agencies in Turkey promote English language courses, but almost 60% of them have never attended a workshop. Frequency of travel among young travellers grew in the last five reported years by 17%. Even though international higher education represents only 2% in terms of market size, it accounts for almost 33% in terms of market value. 47% of senior travel executives consider emerging markets as one of the single biggest growth opportunities. Private education represents approximately 30% of all international education. Seven out of 10 English language travel students in Australia are recruited by agencies. 57% of tertiary students in Germany have monthly income of up to €800. All materials contained in this website, www.student-market.com, are protected by law and no part may be reproduced or used for any purpose other than for private viewing purposes. User understands that the information presented is from sources believed to be reliable, but StudentMarketing disclaims any warranty, express or implied, and any liability therefore.